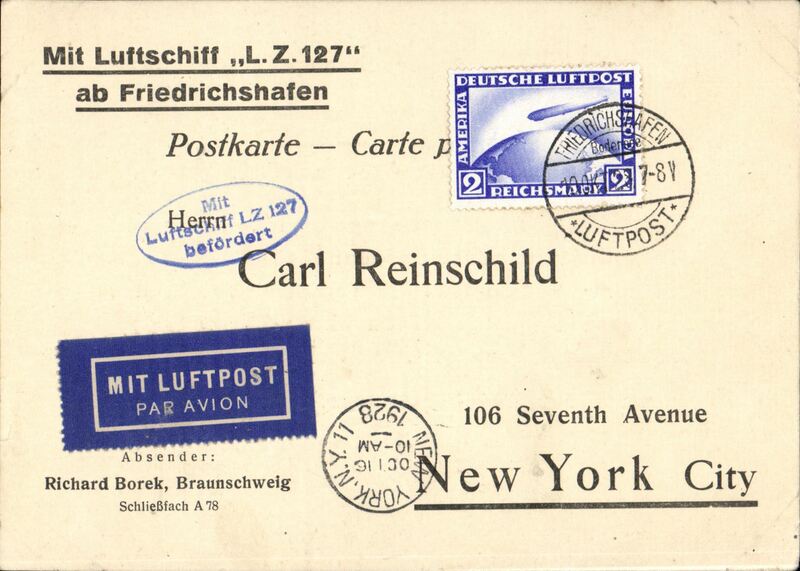 ZR3 delivery flight, Germany to US, franked, 50pf, canc Friedrichshafen dr. cds, oval flight ZR3 confirmation cachet, black/green "Mit Luftpost" vignette, souvenir cover "Mit Luftschiff ZR III ab Friedrichshafen". 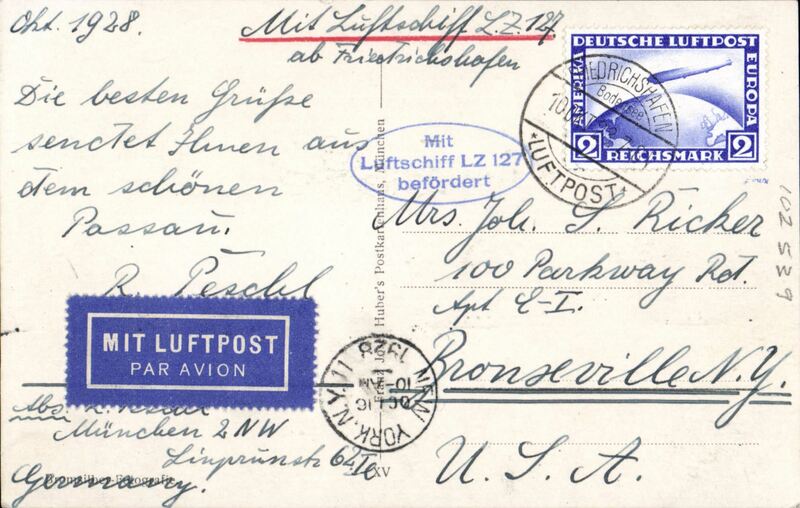 First flight ZR3 (LZ126) Germany to America, franked 100 pfg canc Friedrichshafen cds, New York b/s 15/10, printed souvenir PC, red "Mit Luftschiff ZR 3 ab Friedrichshafen" and violet oval "Mit Luftschiff ZR 3 Befordert" handstamps, blue/dark blue vignette depicting ZR3 flying over the Statue of Liberty, unusual green/black 'Mit Luftpost' etiquette. 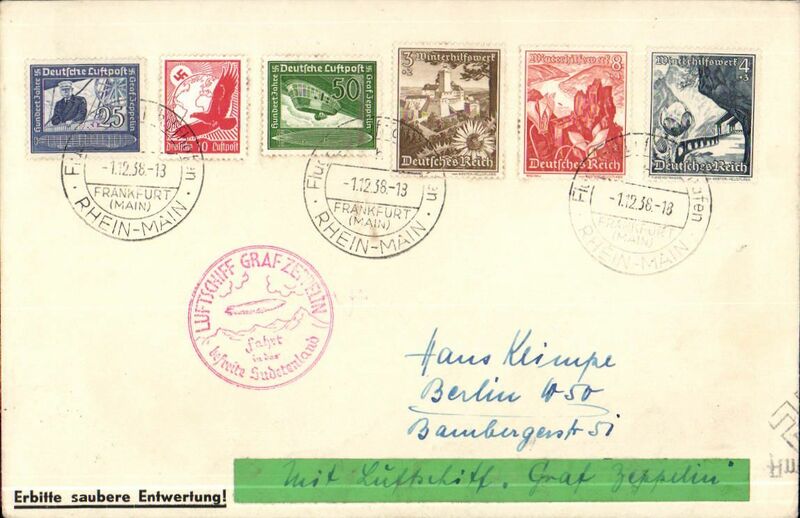 ZR3 delivery flight, Germany to US, bs 15/10, franked 1924 airs 10, 20x2, 50pf, canc Friedrichshafen dr. cds, oval flight ZR3 confirmation cachet, black/green "Mit Luftpost" vignette, uncommon attractive souvenir cover "Mit Luftschiff ZR III ab Friedrichshafen" in red. 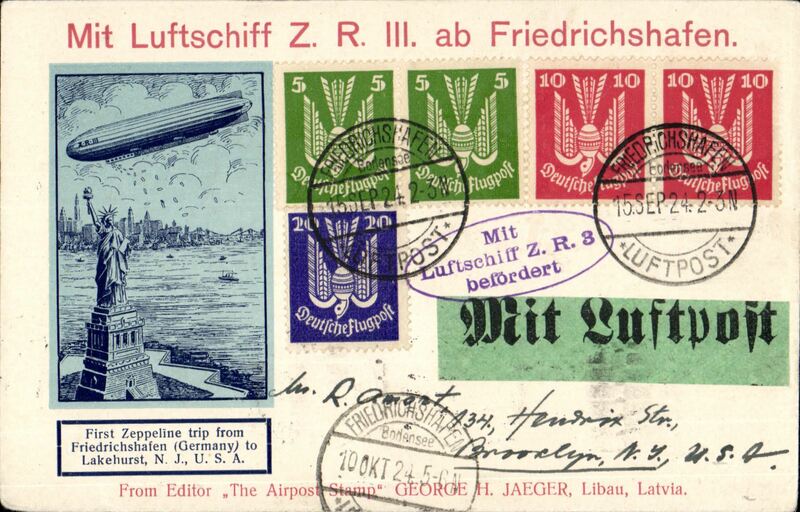 "From Editor, The Airpost Stamp, George H Jaeger, Libau, Latvia" with inset picture of Zeppelin flying past Statue of Liberty. A neat hand drawn map of the route accompanies this item. 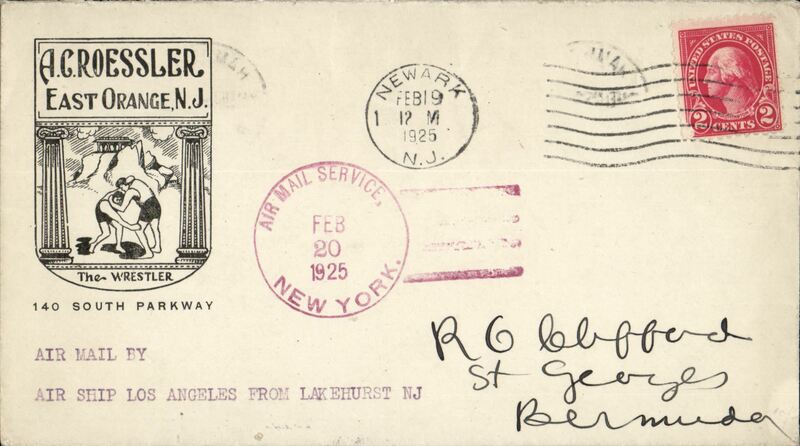 Airship USS "Los Angeles", Lakehurst to Hamilton (Bermuda),bs 22/4, franked 2c rate, canc red "New York Airmail Service" cds, souvenir cover. 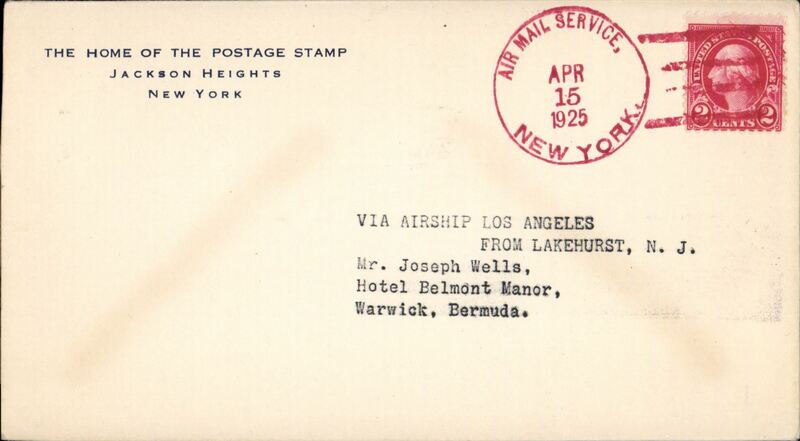 Airship USS "Los Angeles", Lakehurst to Hamilton (Bermuda),bs 22/4, franked 2c rate, canc red "New York Airmail Service" cds, plain cover. 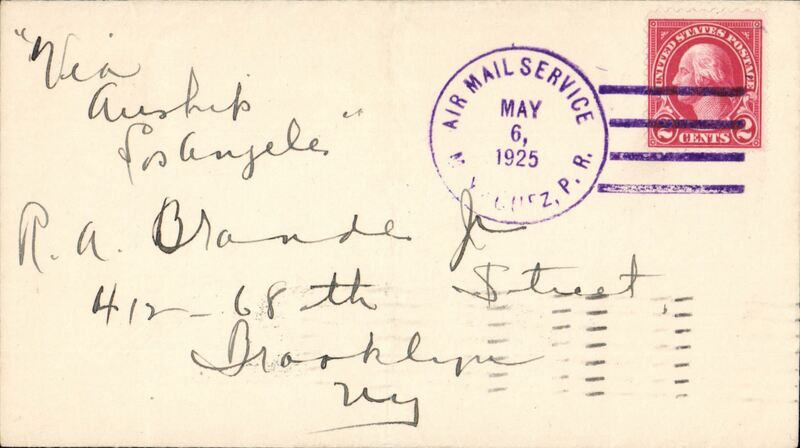 Cover flown Hamilton to New York, on the Return of the Second Bermuda flight of Airship USS "Los Angeles", Aug 24 arrival ds, typed endorsement "By Air Mail/by Airship 'Los Angeles'/from Bermuda to Lakehurst, NJ". 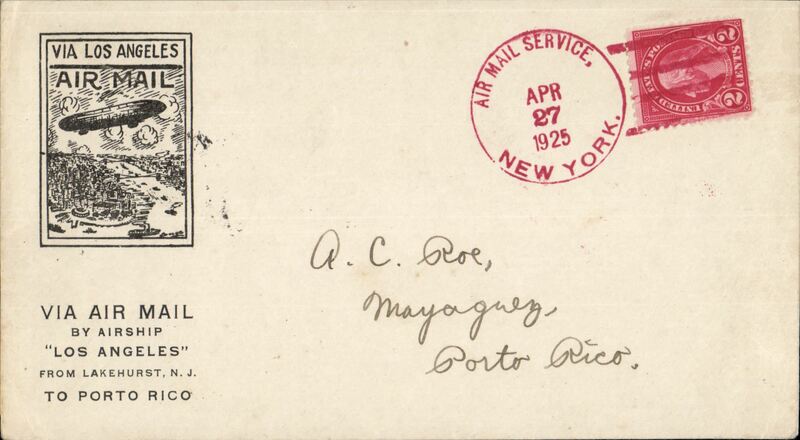 First mail flight Airship USS "Los Angeles Lakehurst to Mayaguez, Puerto Rico, bs 5/5, magenta air mail "Air Mail Service Apr 27 New York cancellation tying US 2c , printed 'Via Air Mail/By Airship/Los Angeles/from Lakehurst NJ/to Puerto Rico. 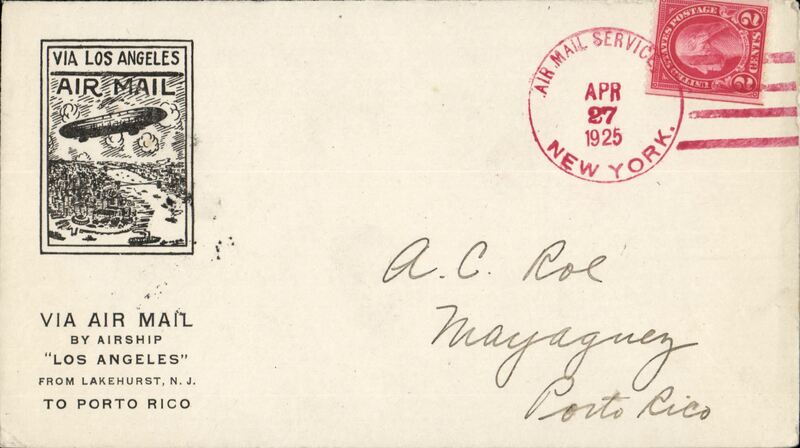 Return flight if USS Airship Los Angeles from Mayaguez (Puerto Rico) to New York, ms 'Via Airship Los Angeles', plain cover franked 2c canc violet 'Air Mail Service/May 6 1925/Maguez P.R. 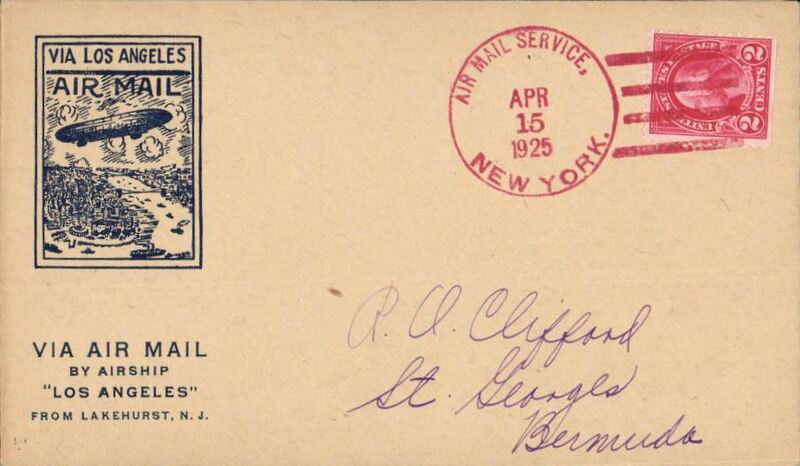 ', bs City Hall Sta NY/May 11/1925. 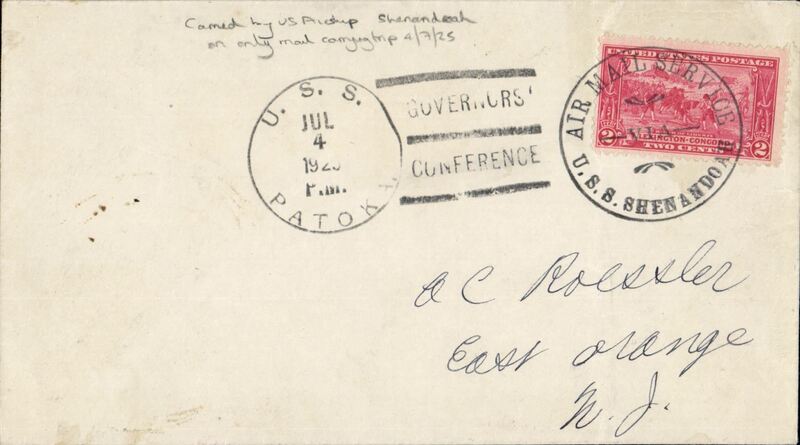 Airship USS "Shenandoah", Governors Conference Flight from Lakehurst to Bar Harbor, plain cover franked 2c canc black circ cachet "Air mail Service via USS Shenandoah" and postmarked "USS Patoka Jul 4 Governors Conference". 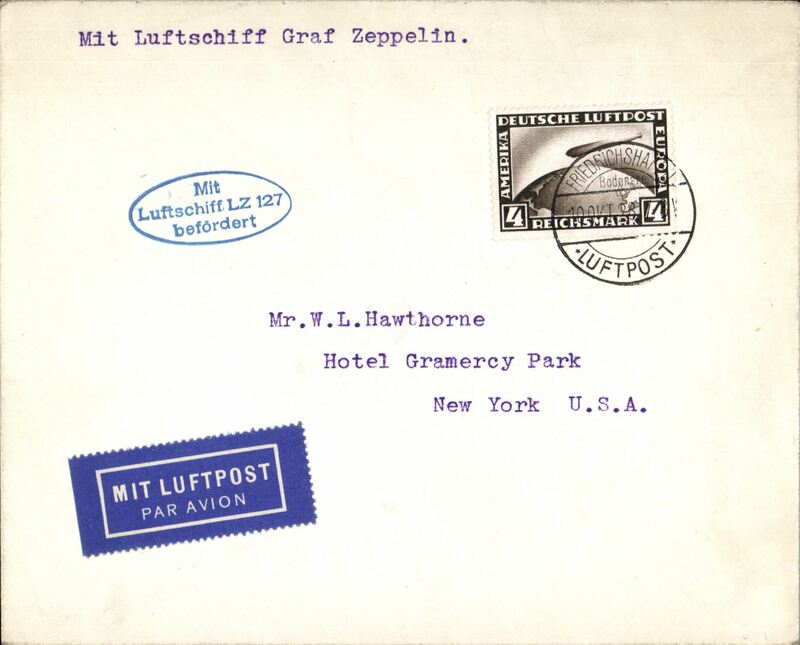 Graf Zeppelin, Friedrichshafen to Lakehurst, New York arrival ds on front, B&W PPC of Passau franked Zeppelin 2RM canc Friedrichshafen/Luftpost cds, blue oval confirmation stamp. Accompaied by 2002 Leder expertisation certificate. 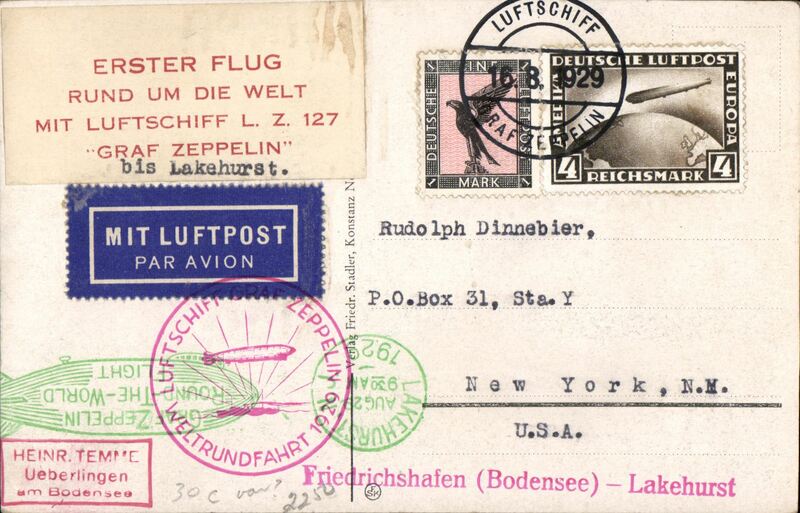 First Trans-Atlantic crossing to Lakehurst, bs New York 16/10, oval blue flight cachet, plain cover franked 4Rm Zeppelin stamp tied Friedrichshafen/Luftpost cds. 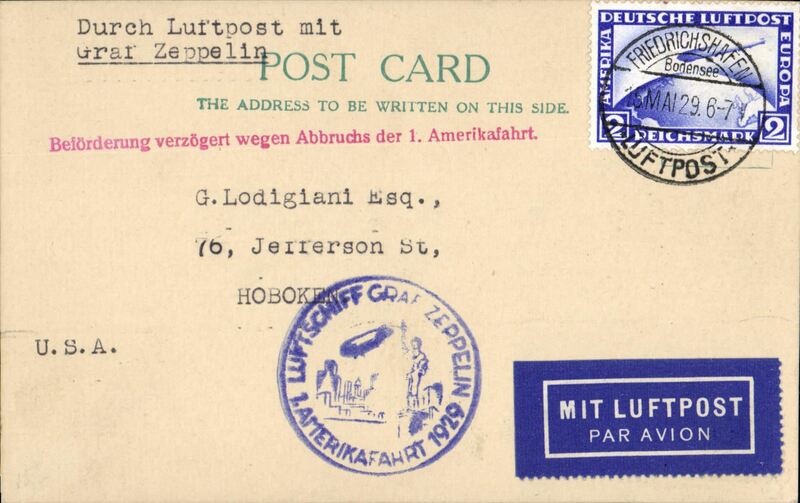 First Trans-Atlantic crossing of the Graf Zeppelin to Lakehurst, New York bs 16/10, oval blue flight cachet, commercial corner cover franked 2Rm x2 Zeppelin control pair stamps (Stanley Gibbons number 444 - adhesives alone catalogues £94), tied Fried. cds. Si 21A. A neat hand drawn map of the route accompanies this item. 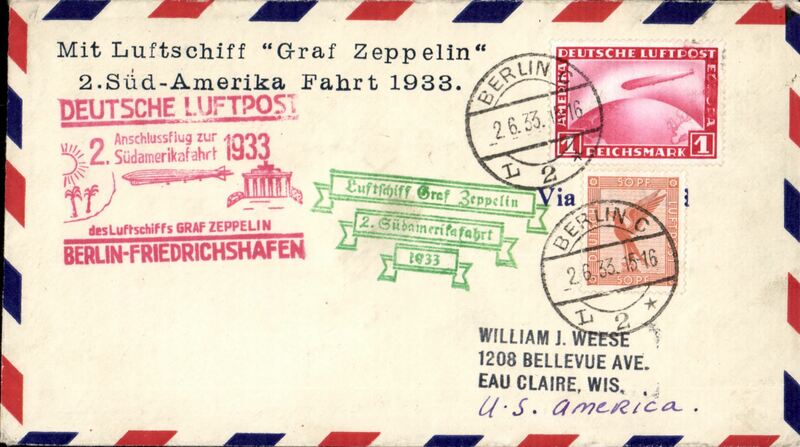 Return flight "Graf Zeppelin" USA to Germany, b/s Friedrichshafen 1/11, US 2c PSC with additional $1 and 3c (one blunt corner perf), magenta US flight confirmation cachet. A neat hand drawn map of the route accompanies this item. 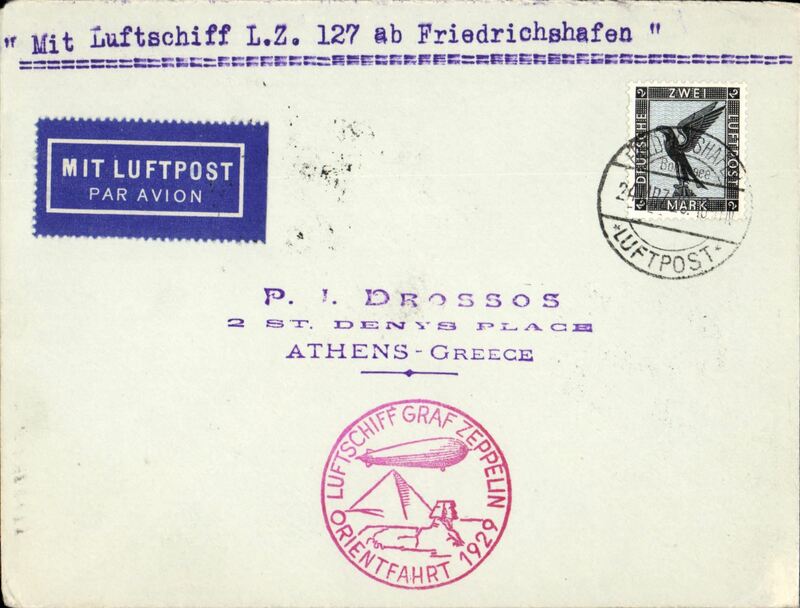 Graf Zeppelin, Athens drop 1929 Orient flight, Germany 2M (C33) tied by Friedrichshafen 3/24/29, bs Athens/30 MAP 29 cds, fine strike red flight cachet. 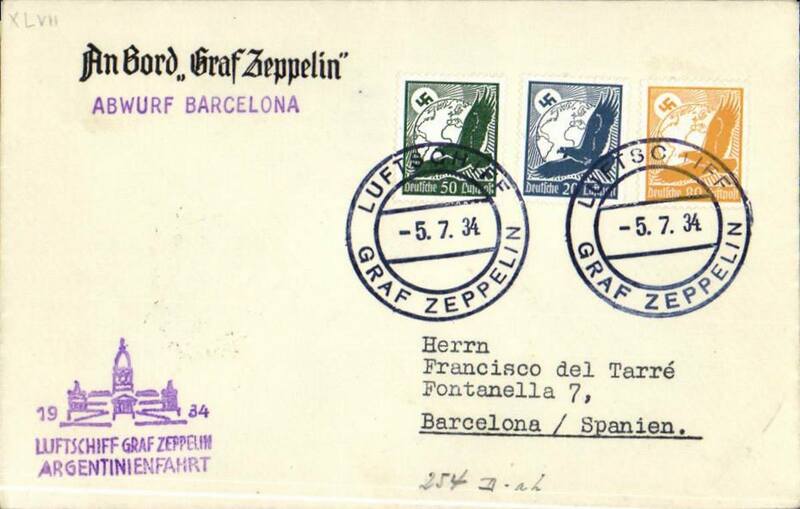 Graf Zeppelin Mediterranian flight, Germany to Spain, unofficial drop at Seville, bs 24/4 and on to Madrid 25/4, red fligh confirmation cachet. 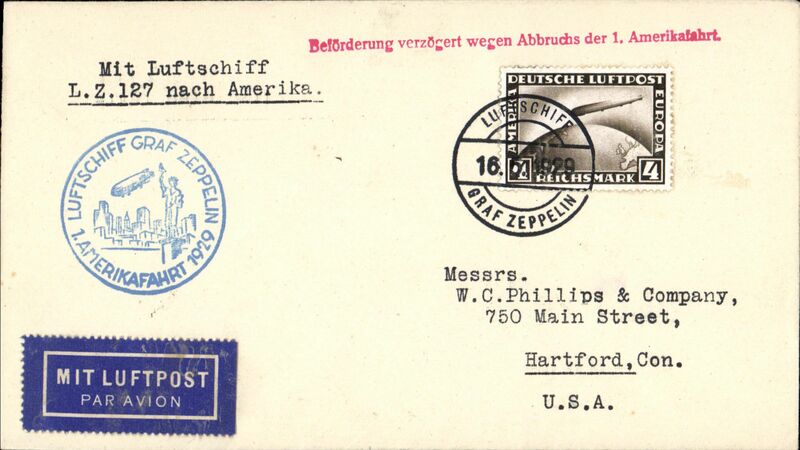 Graf Zeppelin interrupted America flight, landing in Cuers, PC franked 2m canc Friedrichshafen/Luftpost cds, arrived in New York August 5th, circular blue flight confirmation cachet, red straight line interruption confirmation cachet. 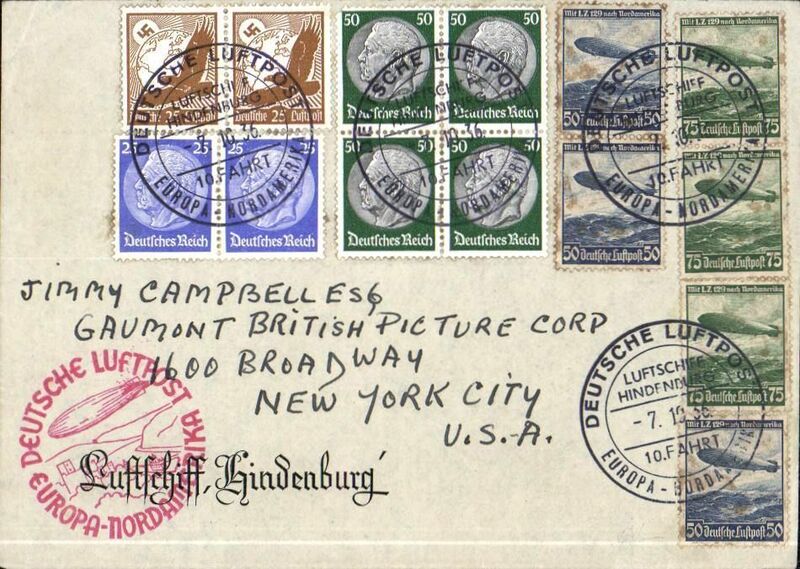 Graf Zeppelin interrupted America flight, landing in Cuers, plain cover franked 4m (Stanley Gibbons number 445 catalogue £32) canc Friedrichshafen cds, arrived in New York August 5th, circular blue flight confirmation cachet, red st. line interruption confirmation cachet. 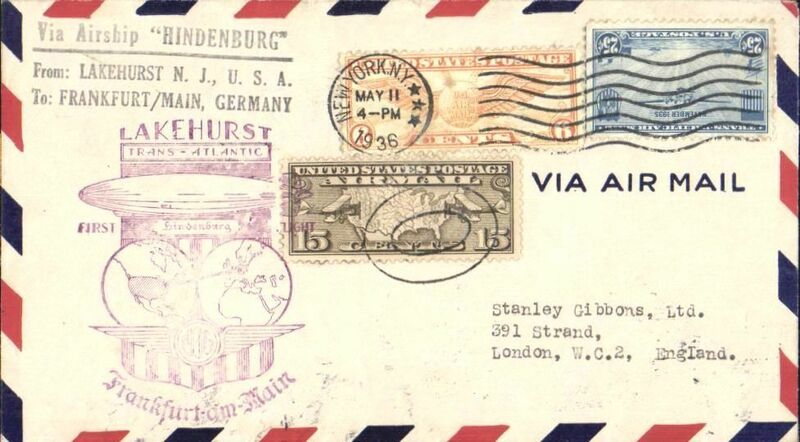 Graf Zeppelin interrupted America flight, landing in Cuers, plain cover franked 4m (Stanley Gibbons number 445 catalogue £32), On Board 16/5/29 cancel, arrived in New York August 5th, circular blue flight confirmation cachet, red st. line interruption confirmation cachet. A neat hand drawn map of the route accompanies this item. 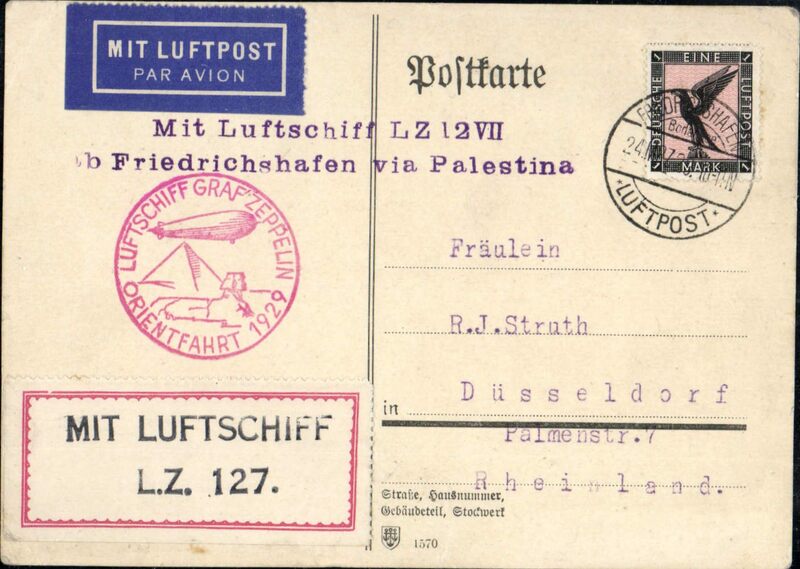 Graf Zeppelin Orient flight over the Near East, Friedrichshafen to Er Ramle, card franked 1926 1M and black air stamp, official red flight cachet, red/white "Mit Luftschiff/LZ 127" vignette on front. 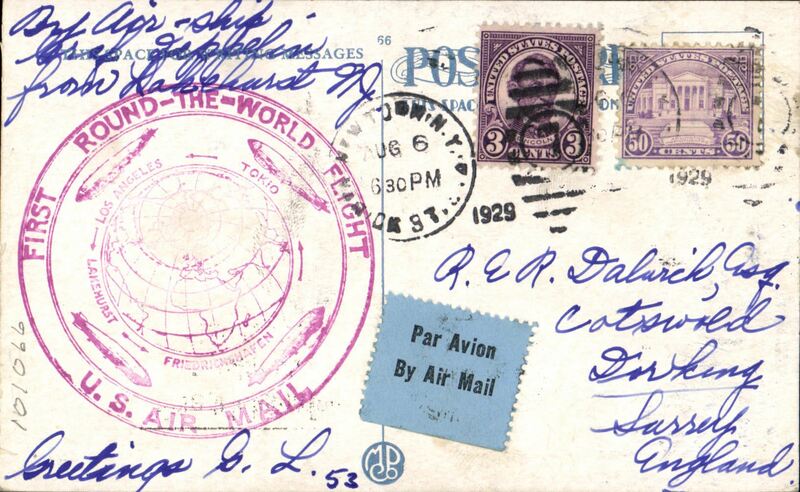 Aug 7, 1926, Round the World Flight, Lakehurst to Friedrichshafen, bs 10/8, PPC franked 53c, canc New York Aug 6 cds, large violet US confirmation cachet. 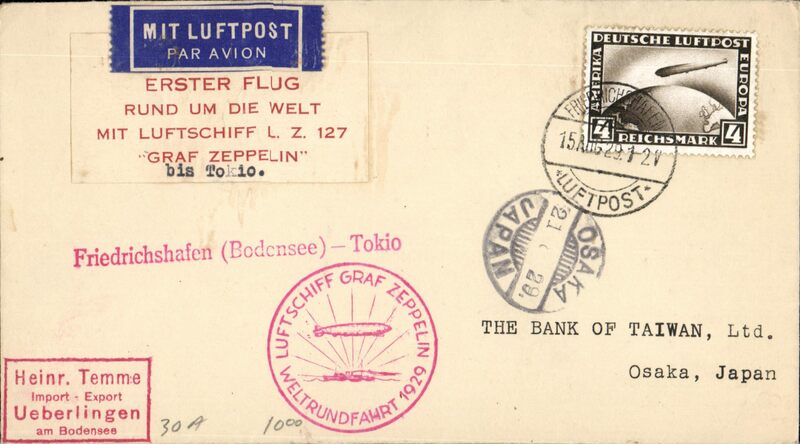 LZ 127, Round the World flight, Friedrichshafen to Tokyo, Osaka 21 8 29 arrival ds on front,plain cover franked 4m (Stanley Gibbons number 445 catalogue £32), red circular Germany flight confirmation cachet, red/white vignette "Erster Floug/Rund Um Die Welt/Mit Luftschiff LZ 127/Graf Zeppelin (typed 'bis Tokyo"). 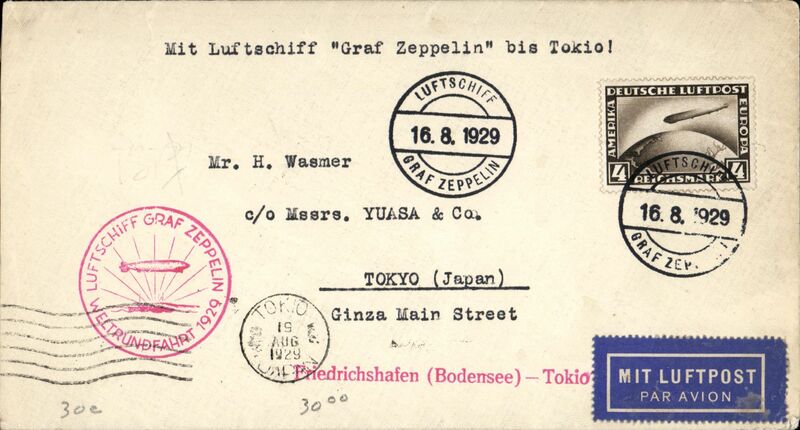 Graf Zeppelin, Friedrichshafen to Tokyo, red/cream souvenir cover printed "Friedrichshafen (Bodensee) -Tokyo", franked 4m (Stanley Gibbons number 445 catalogue £32), on board 16/8/29 cancel, arrived in Tokyo 19 Aug 1929 arrival ds on front, red circular flight confirmation cachet, blue/white airmail etiquette. 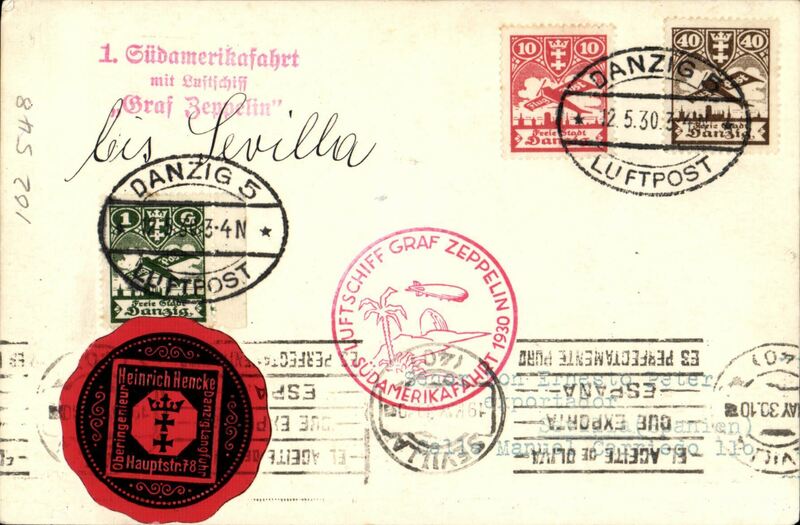 Graf Zeppelin Round the World Flight, Friedrichshafen to Friedrichshafen, souvenir card with red printed "Friedrichshafen (Bodensee) -Friedrichshafen (Bodensee)" cachet, franked 2x 2M (Stanley Gibbons number 444, each catalogue £47) and 3M (Stanley Gibbons number 399, catalogue £80), postmarked Friedrichshafen/Luftpost/15 Aug 29, red circular flight confirmation cachet, black/yellow airmail etiquette. 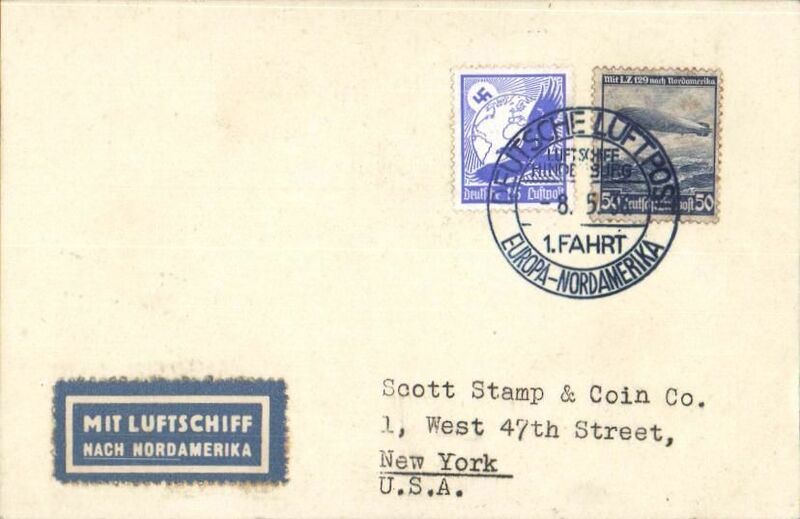 Francis Field authentication hs verso. 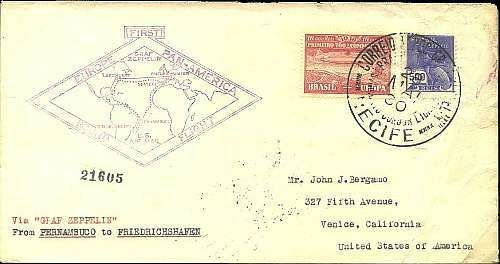 Graf Zeppelin Round the World Flight, Friedrichshafen to Lakehurst, green Lakehurst Aug 29, 1929 receiving cachet on front, souvenir B&W PPC printed "Friedrichshafen (Bodensee) -Lakehurst" and showing Graf Zeppelin flying over river bridge, franked 4M (Stanley Gibbons number 445 catalogue £32) and 1M (Stanley Gibbons number 397), on board 16/8/29 cancel, red circular flight confirmation cachet, dark blue/white airmail etiquette. 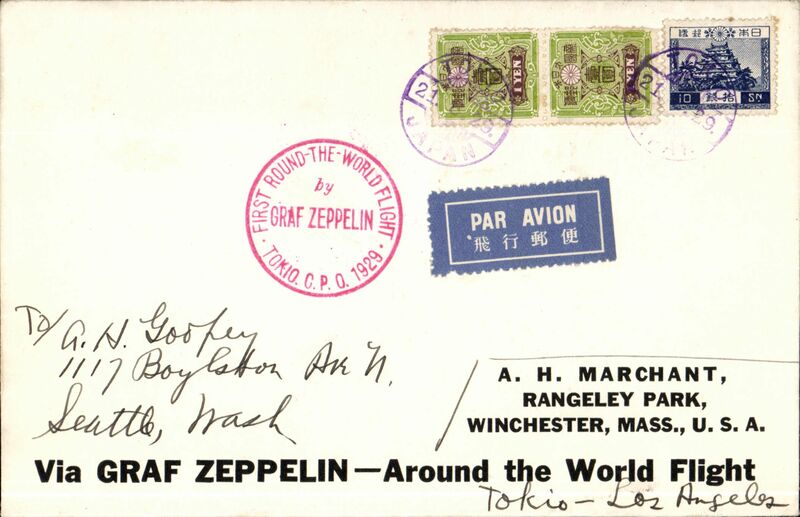 LZ 127, Round the World flight, Tokyo to Los Angeles, bs Aug 26 1929, printed souvenir cover 'Via Graf Zeppelin - Around the World Flight', franked 12 Yen, red circular Japan flight confirmation cachet. 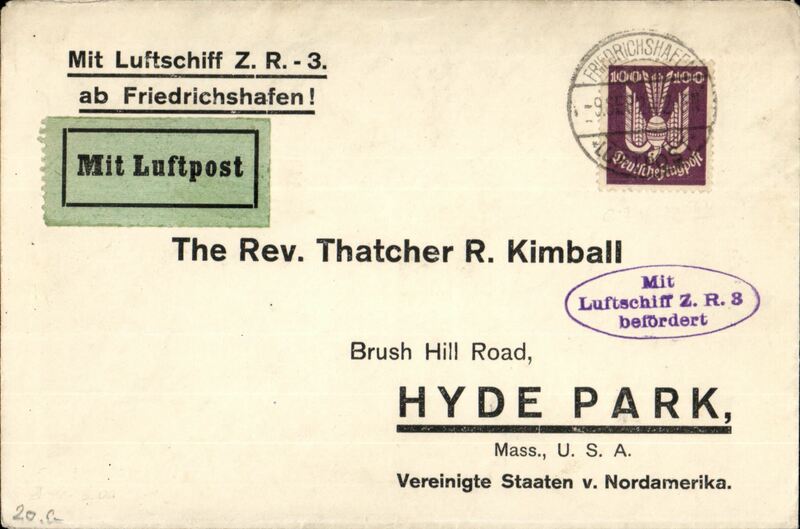 Scarce item in fine condition. 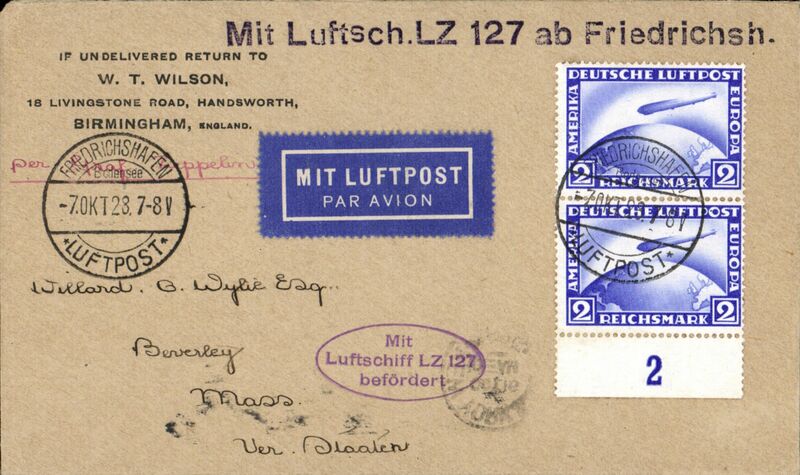 LZ 127, Round the World flight, Los Angeles to Friedrichshafen, bs 4/9, buff card franked 90c, large violet flight confirmation cachet, Si 29B (85 Euro). 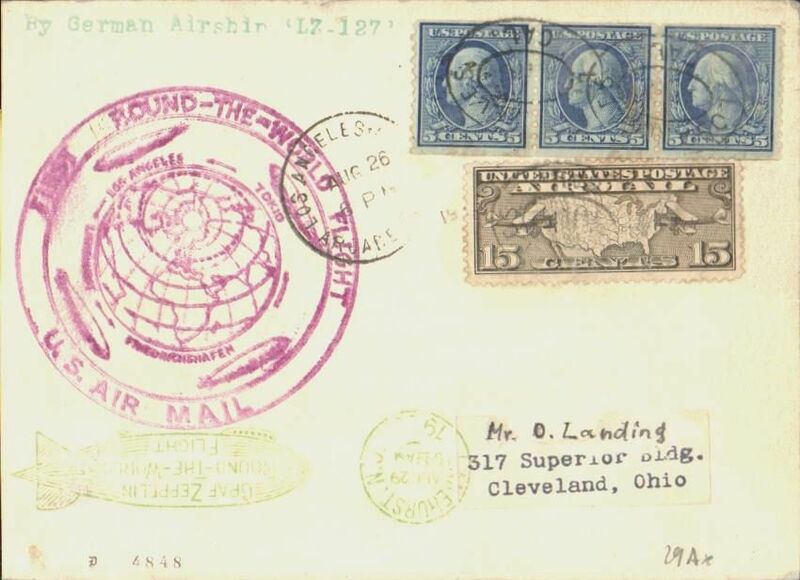 LZ 127, Round the World flight, Los Angeles to Lakehurst, bs US green Aug 29 'Zeppelin' arrival ds, airmail cover franked 60c, large circular violet flight confirmation cachet, Si 29A (75 Euro). 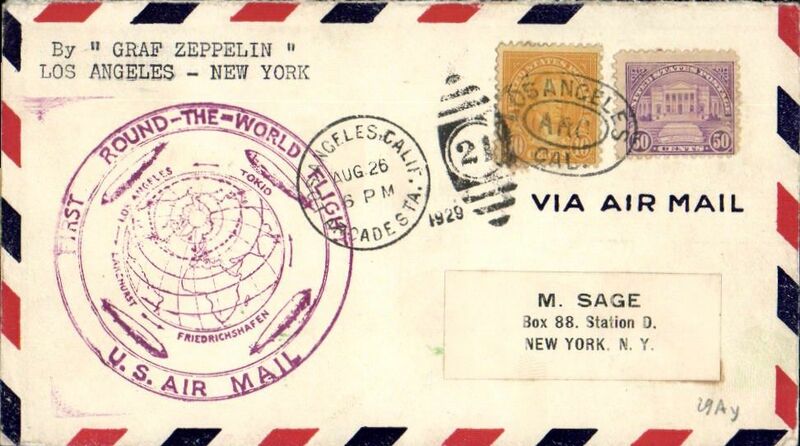 LZ 127, Round the World flight, Los Angeles to Lakehurst, bs US green Aug 29 'Zeppelin' arrival ds on front, airmail cover franked 60c, large circular violet flight confirmation cachet, Si 29A (75 Euro). 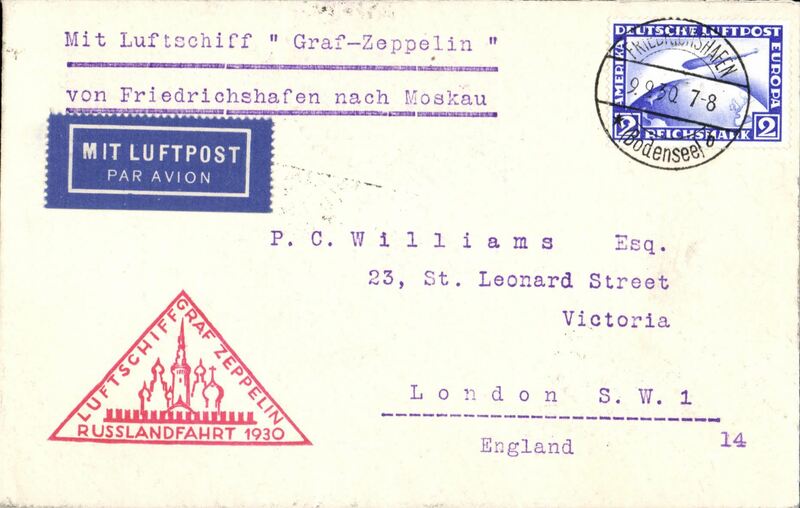 1929 Balkans and Silesia flight, dropped at Breslau, 'Zeppelin-Postkarte' PPC franked 50pf, on board cancel 7/10, red framed 'Mit Luftschiff Graf Zeppelin Befordert' confirmation cachet. 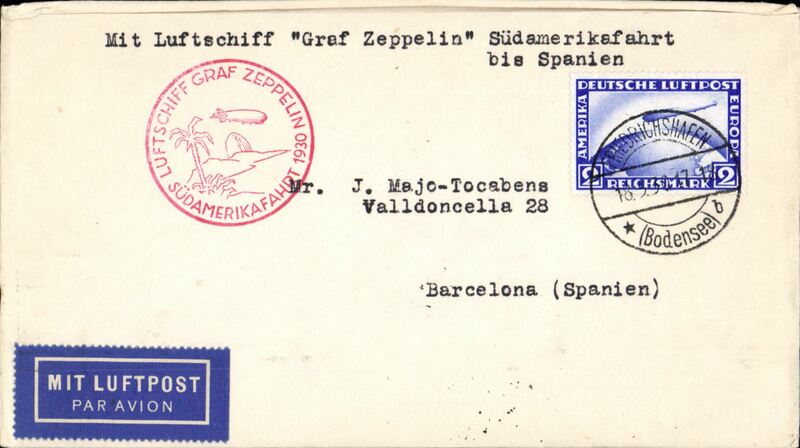 Spain flight, PC franked 50pf, canc on board 'Luftschief/23.10.1929/Graf Zeppelin' cds, also framed red 'Mit Luftschiff Graf Zeppelin befordert' and red 'Mit Luftpost befordert/flughafen Hallr (Leipzig)/(Schfeudit)' hs. 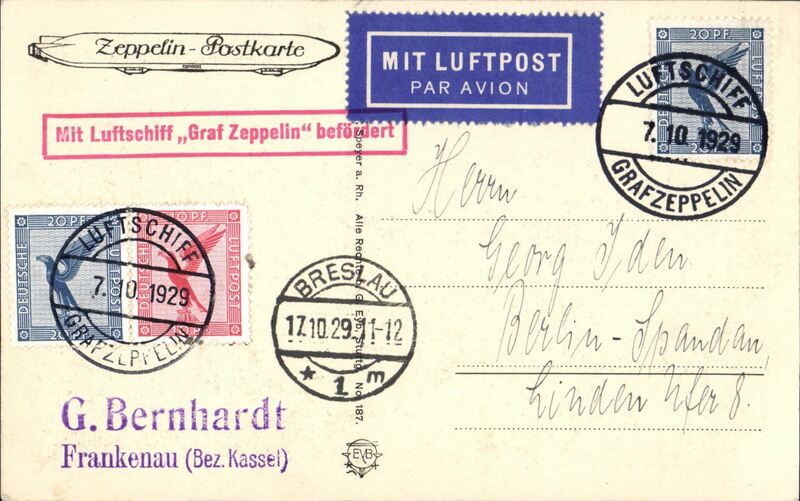 Swiss flight, bordpost card dropped at St. Gallen, 2/11arrival ds on front, franked 1923 25c and 50c air, red dr. "Zeppelinpost/Schweizer"" cachet, on sepia scenic PPC. 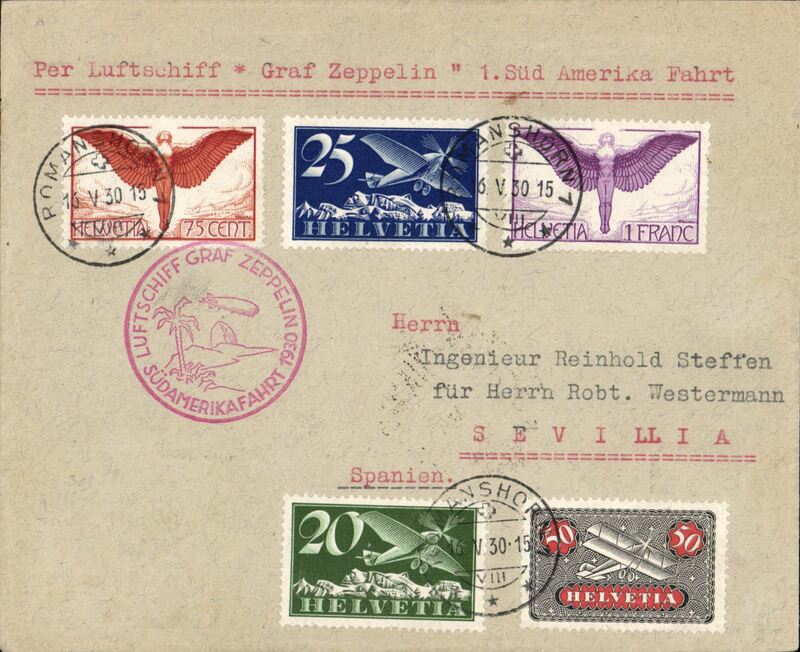 Graf Zeppelin Spain Flight, Friedrichshafen to Seville 16/4 arrival ds on front, sepia PC pc showing Koblez a Rhein, franked 1M, red framed 'Mit Luftpost Luftschiff Graf Zeppelin befordert' flight confirmation hand stamp. 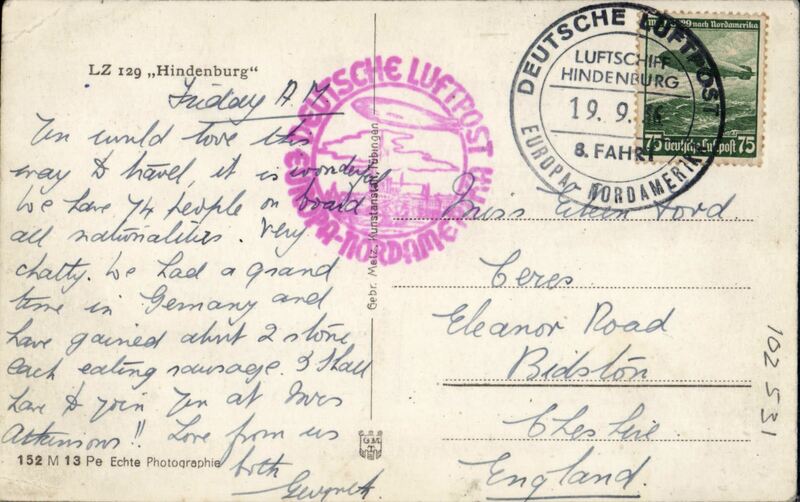 First acceptance for Latvia, for carriage on the Graf Zeppelin Spain Flight, Friedrichshafen to Seville 16/4 arrival ds on front, and OAT via Paris Avion 19/4 and Berlin/L2/19.4.30, plain cover franked Zeppelin 2M, red framed 'Mit Luftpost Luftschiff Graf Zeppelin befordert' flight confirmation hand stamp., and red framed 'Mit Luftpost befordert/Luftpostampt Berlin C2' transit hs. Tiny non invasive lower LH corner nibble and some faint perf toning, see scan. 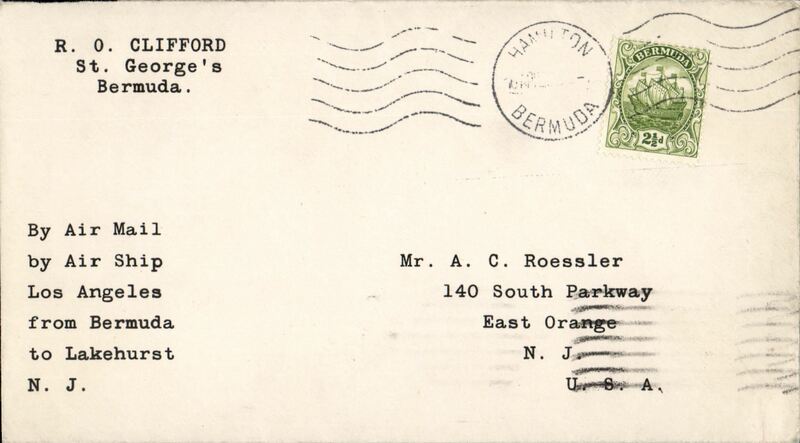 Francis Field authentication hs verso. 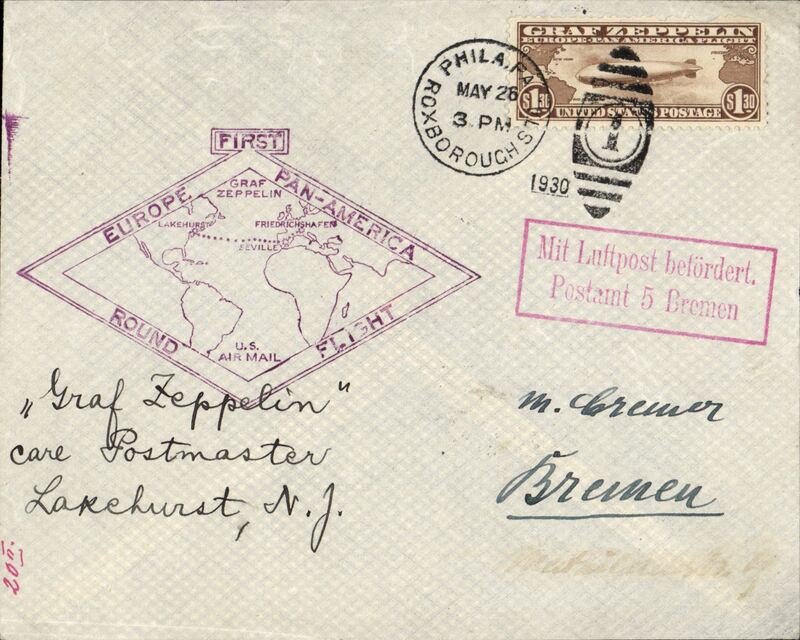 Graf Zeppelin Europe-Pan America Round Flight, Lakehurst return to Friedrichshafen, bs 6/6, and on to Bremen, plain cover franked US $1.30 Zeppelin stamp, canc 'Roxborough/Phila/May 26, violet diamond Europe-Pan America Round Flight' cachet, red framed 'Mit Luftpost befordert/Postamt Bremen' hs. 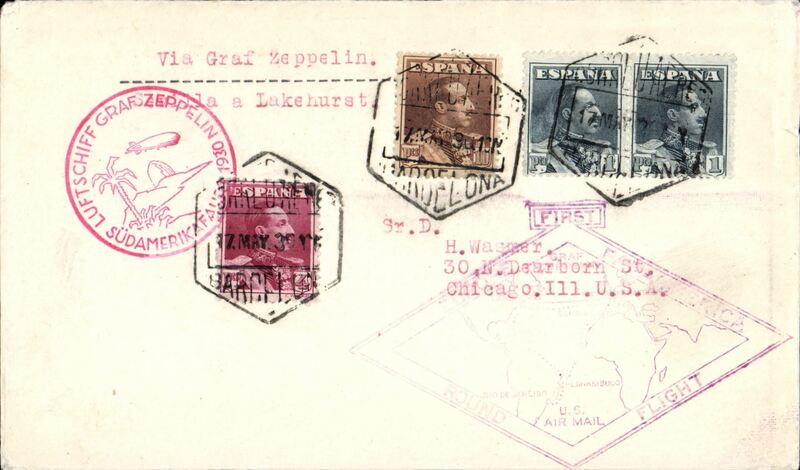 Austria acceptance for LZ 127 first South America Flight, Seville first landing, 19/5 arrival machine cancel on front, B&W PC pc showing Graf Zeppelin flying over cathedral with very tall spire, franked Austria 1S 84g, canc Vienna cds, red circular flight confirmation cachet. 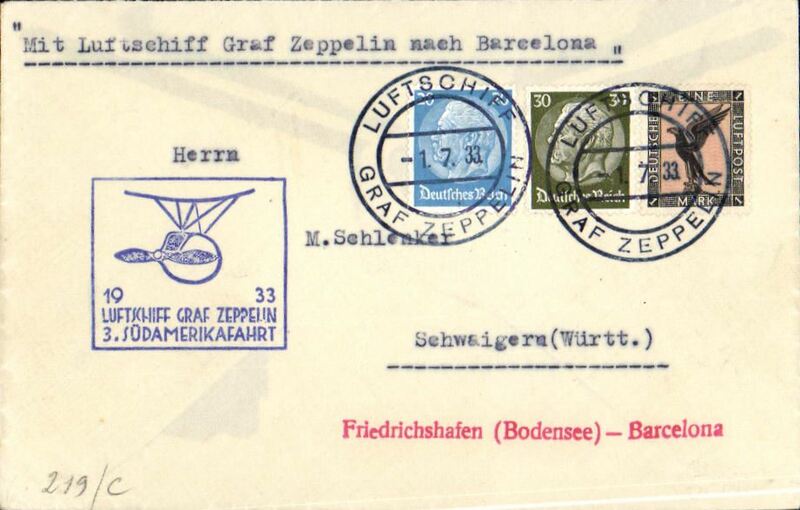 Graf Zeppelin, Danzig accept for Friedrichshafen-Seville first landing, Seville 19 May arrival ds on front, B&W PPC showing GZ franked 1G50 DEanzig stamps canc oval 'Danzig/12.5.30/Luftpost ds, red flight confirmation cachet, attractive circular black/red private seal on front. 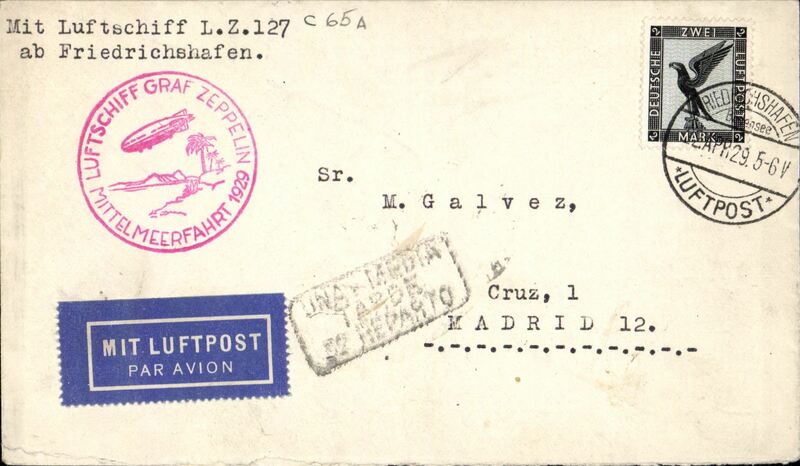 Graf Zeppelin 1st South America flight, Switzerland to Seville, bs Seville Aero 19/5, plain cover franked 1923 air 20c,25c,50c,75c (SG £42 used, and 1F, red flight confirmation cachet. 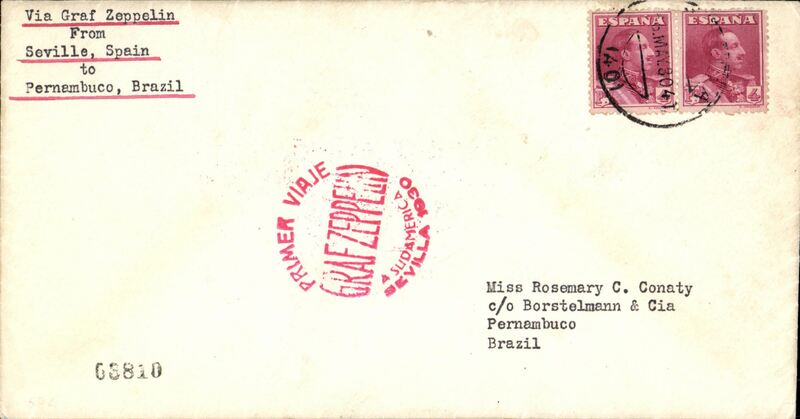 Graf Zeppelin 1st SAF, Seville to Pernambuco, bs, plain envelope franked 8 pts, fine strike red flight confirmation cachet. 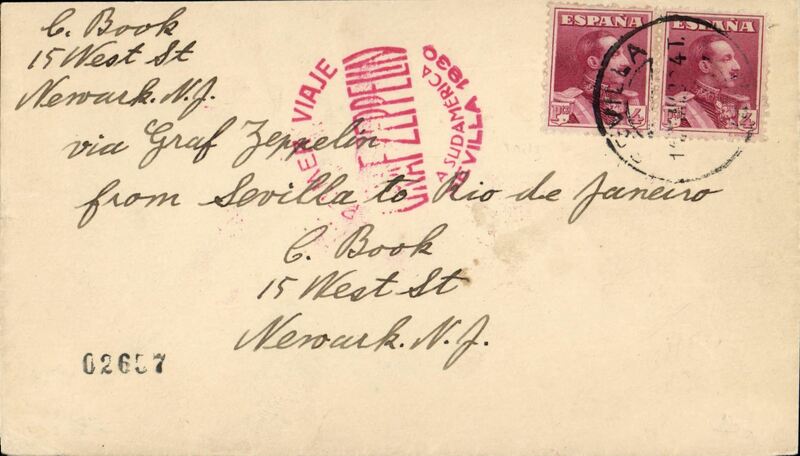 Graf Zeppelin 1st SAF, Seville to Rio de Janeiro, bs 25/5, plain envelope franked 8 pts, red flight confirmation cachet. 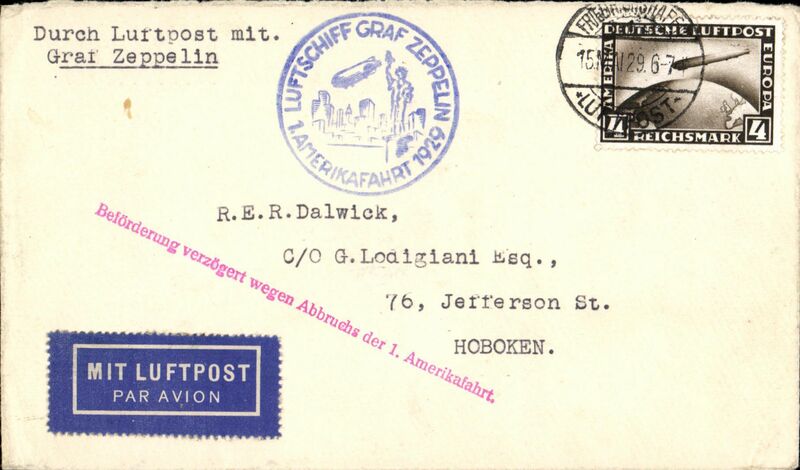 Graf Zeppelin 1st SAF, Seville to Lakehurst, Graf Zeppelin bs 31/5, plain envelope franked 20 pts, fine strike red flight confirmation cachet. 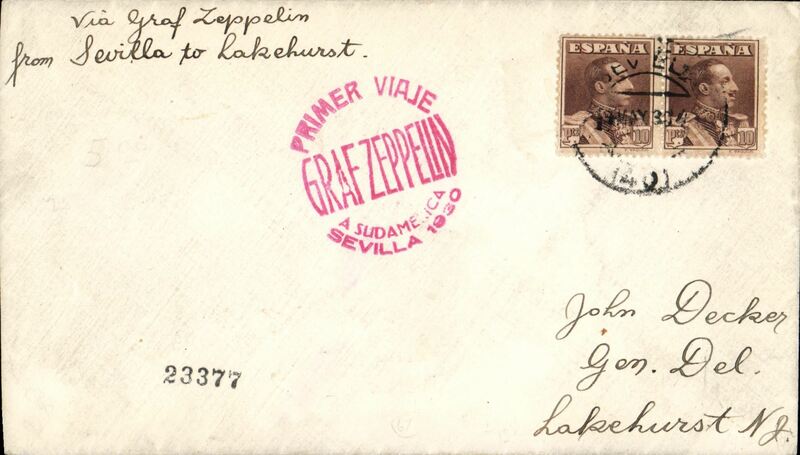 Graf Zeppelin, Barcelona to Chicago, carried from Seville to Lakehurst, green Zeppelin bs 31/5, plain cover franked 16 pf, red 'Sudamerika' flight cachet, violet 'Round the World Flight' cachet. 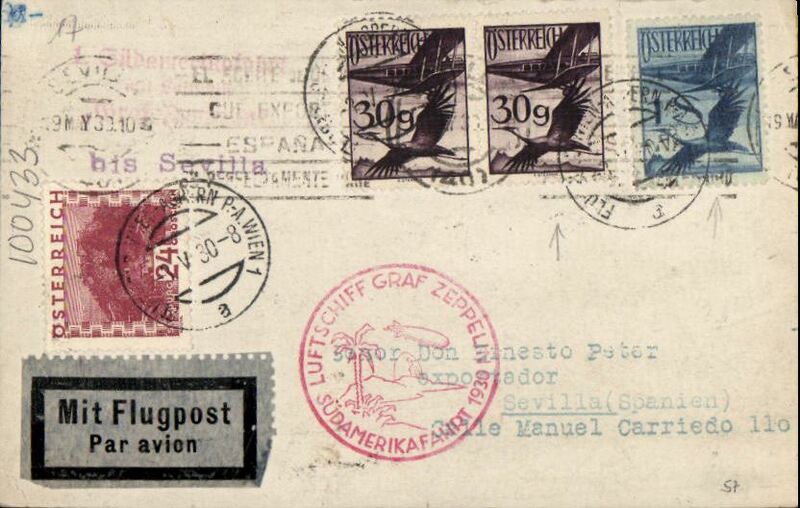 Graf Zeppelin South America flight, Germany to Spain, landed at Seville 19/5, airmail etiquette cover franked 2Rm canc Fredrichshafen 18/5, red flight confirmation cachet. 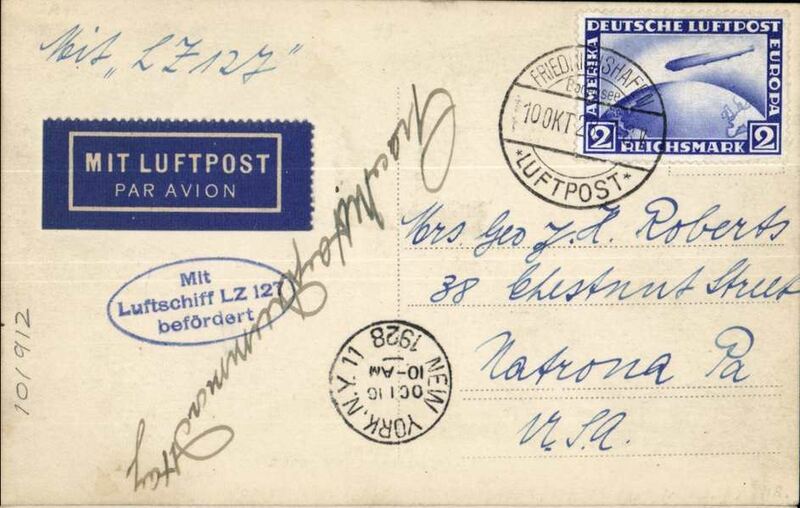 Graf Zeppelin, 6th SAM flight, Sevile to Rio de Janeiro, oval 25 May arrival ds verso, red Graf Zeppelin fight confirmation cachet, also black 'Syndicato Condor/25 May 30/Rio de Janeiro' hs on front. 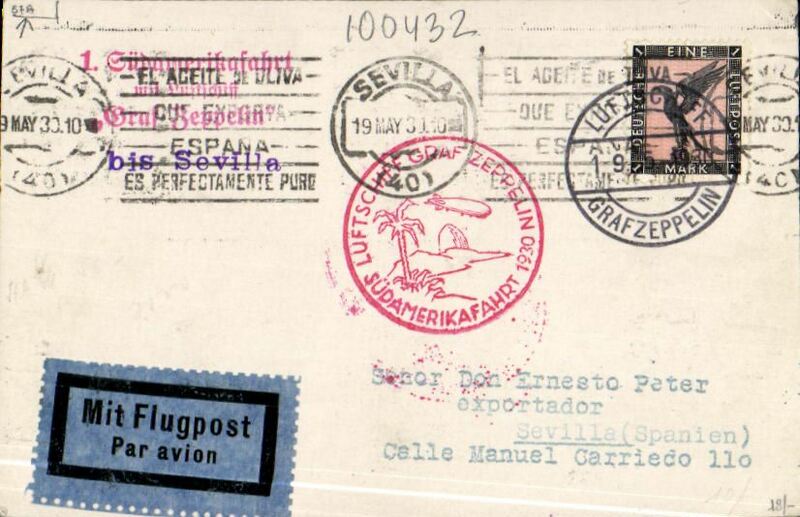 First South America Flight, Seville first landing, 19/5 arrival machine cancel on front, B&W PC pc showing Graf Zeppelin flying over cathedral with very tall spire, franked German 1M canc ON BOARD cds, red circular flight confirmation cachet, red three line '1, Sudamerikafahrt/..../Graf Zeppelin' hs. 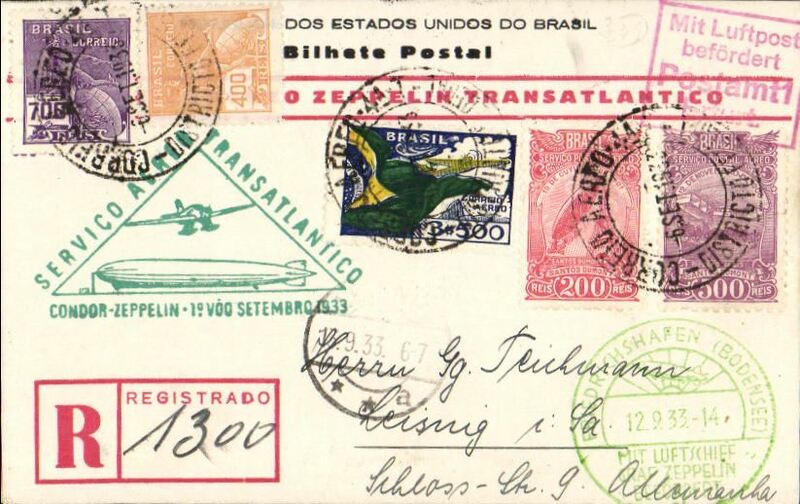 Europe-Pan America Round Flight, Brazilian dispatch, Rio to Friedrichshafen 6/6 to New York 18/6, card franked 10,000r special Zeppelin Brazil stamp + 300r canc black 28 May Recife cachet, violet diamond US flight cachet, typed "Via Graf Zeppelin/from Pernambuco to Friedrichshafen". 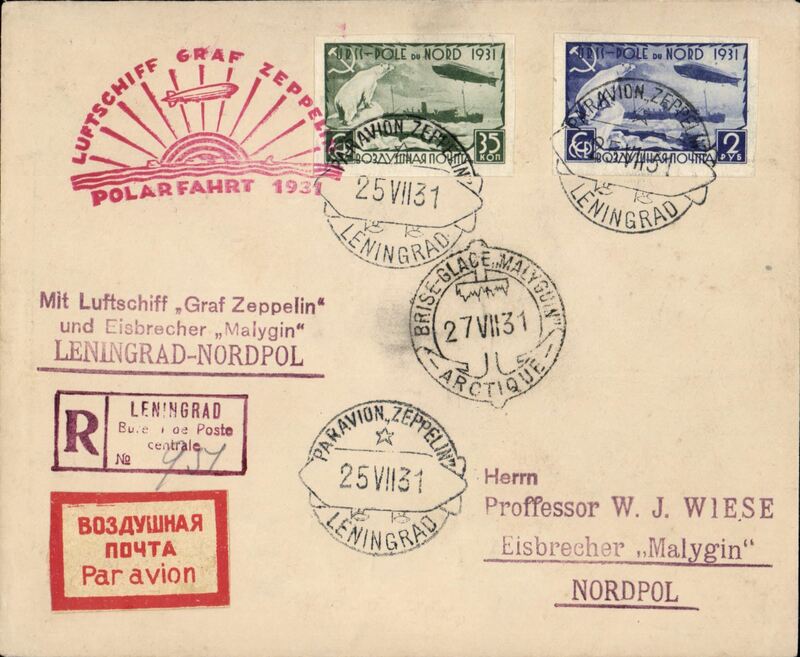 1930 Russia flight, Friedrichshafen to Moscow, bs 11/9, franked Zeppelin 2RM, red triangular flight cachet. 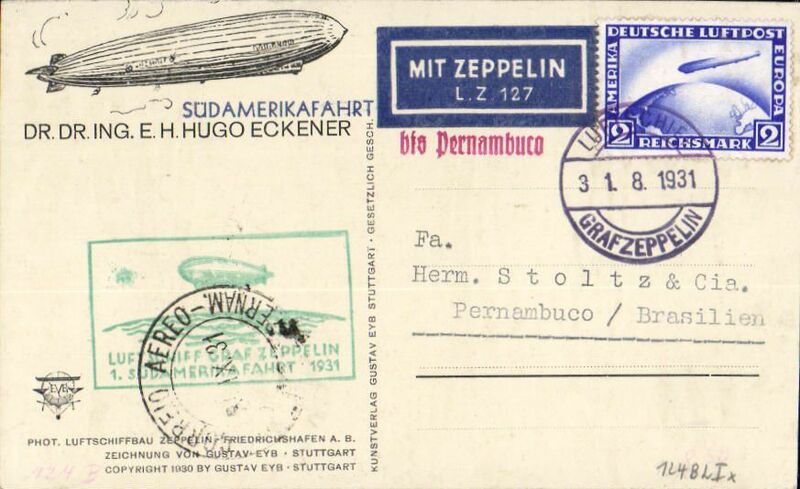 Moscow to Germany, Friedrichshafen, bs 11/9, franked 95k inc Russia Zeppelin 80k tied by black dated Zeppelin cachet postmark, typed "Mit Luftschiff 'Graf Zeppelin'/Moskau-Friedrichshafen", plain cover, S85B(100 Euro). 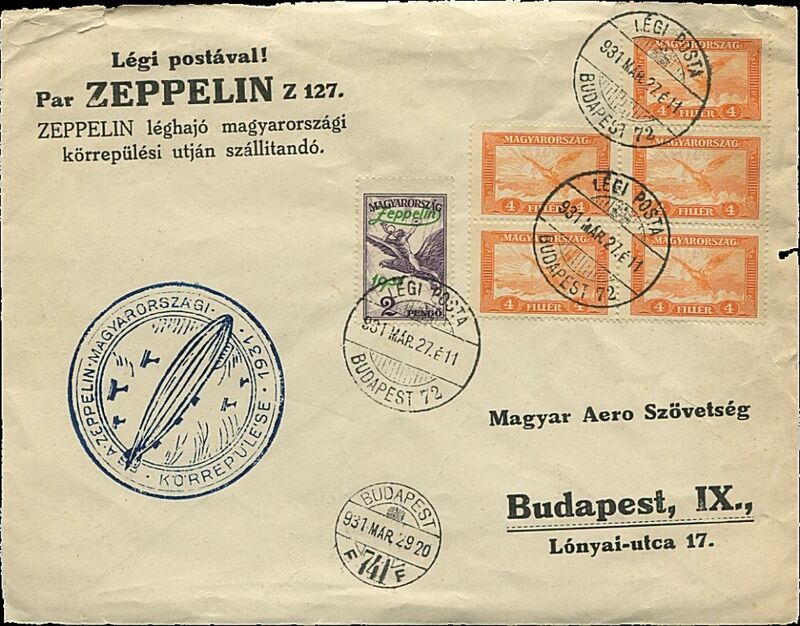 Hungary Round Flight, printed souvenir cover, franking inc. 2P Zeppelin stamp canc Budapest cds, also Budapest arrival ds, blue flight cachet, Sieger 102Ab (150 Euro) .Small closed non invasive nick top left hand edge, otherwise fine. 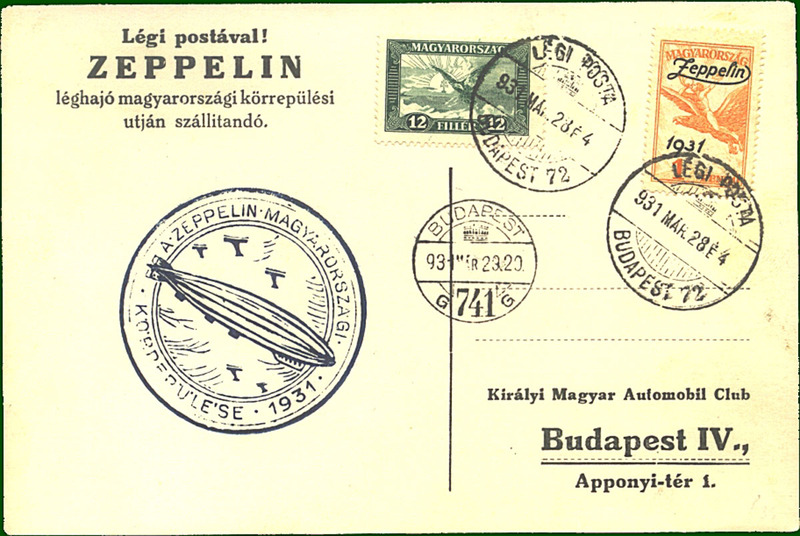 Hungary Round Flight, printed souvenir card, franking inc. 1P Zeppelin stamp canc Budapest cds, also Budapest arrival ds, blue flight cachet, Sieger 102Aa (150 Euro). 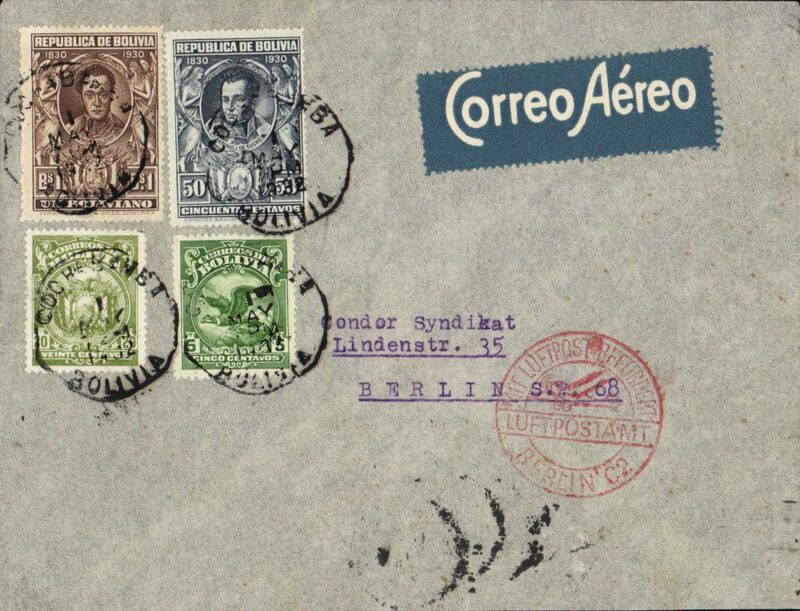 First South America Flight, Germany to Pernambuco, arrival ds on front tying green Pernambuco fight confirmation cachet, Eckener souvenir PC frnked 2Rm (Stanley Gibbons number 447 catalogue £47), On Board cancellation 31/8, red "bis Pernambuco" hs, dark blue/white "Mit Zeppelin/LZ 127" etiquette. Si 124Bb. Akron F/F, Akron C of C. green and violet cachets. 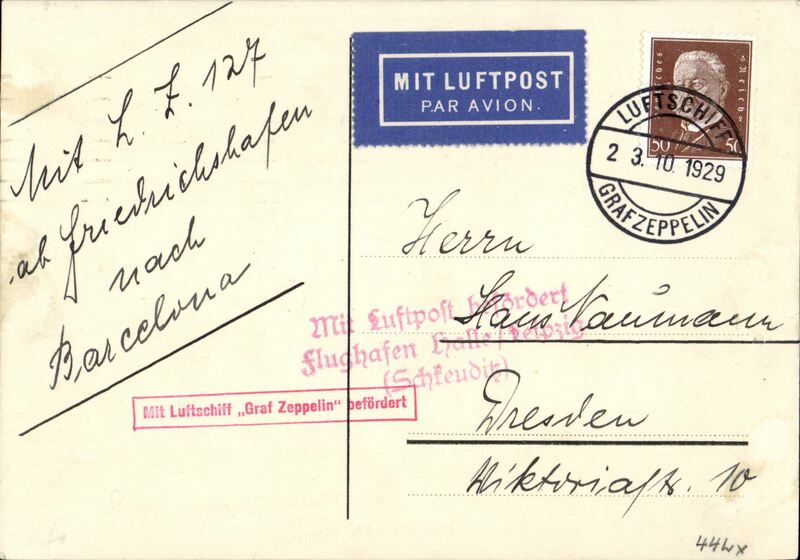 Meningen flight, canc Friedrichshafen, dropped Meningen b/s, oval red confirmation cachet. 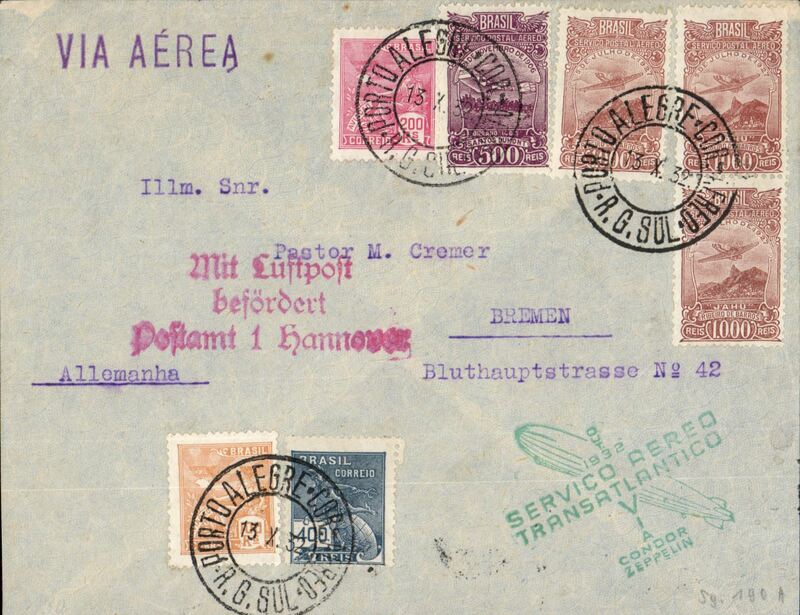 Lloyd Aereo Boliviano/Syndicato Condor/Graf Zeppelin, 2nd S. American flight, Cochabamba to Friedrichshafen 13/4, and on to Berlin 13/4, plain cover franked 1.75B, canc Cochabamba cds, blue/white 'Correo Aerea' airmail etiquette, nice strike red circular "Luftpost Befordert/Luftpostampt/Berlin C2" arrival hs. Carried by LAB from Cochabamba to Puerto Suarez, Condor from Corumba -Campo Grande-Tres Lagadas Rio-Bahia-Recife, Graf Zeppelin to Friedrichshafen. 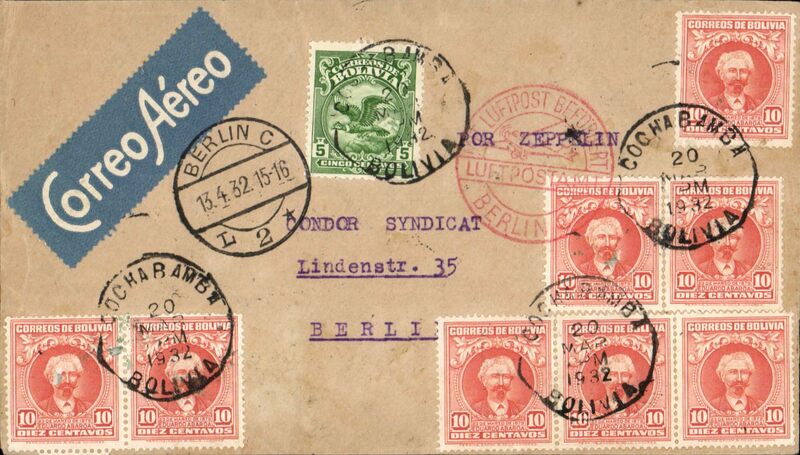 Lloyd Aereo Boliviano/Syndicato Condor/Graf Zeppelin, 2nd S. American flight, La Paz to Friedrichshafen 13/4, and on to Berlin 13/4, plain cover franked 1.75B, canc La Paz cds, violet framed "Primer Correo Aereo/Graf Zeppelin" hs, faint strike red circular "Luftpost Befordert/Luftpostampt/Berlin C2" arrival hs. Carried by LAB from Cochabamba to Puerto Suarez, Condor from Corumba -Campo Grande-Tres Lagadas Rio-Bahia-Recife, Graf Zeppelin to Friedrichshafen. Somewhat scruffy, and closed 1cm tear lh edge. 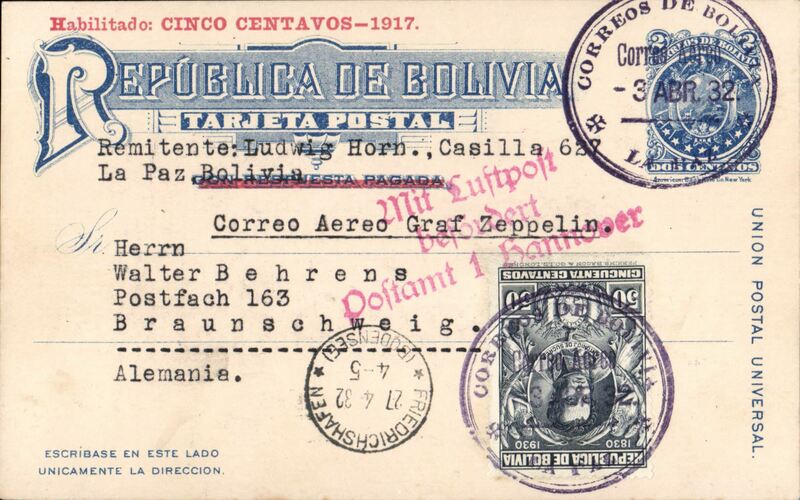 Graf Zeppelin, Bolivia (La Paz) to Braunschweig, via Friedrichshafen, 27/4 arrival ds on front, 2c PSC with nine additional stamps, red three line 'Mit Luftpost/befordert/Postampt 1 Hannover' hs. Attractive item. 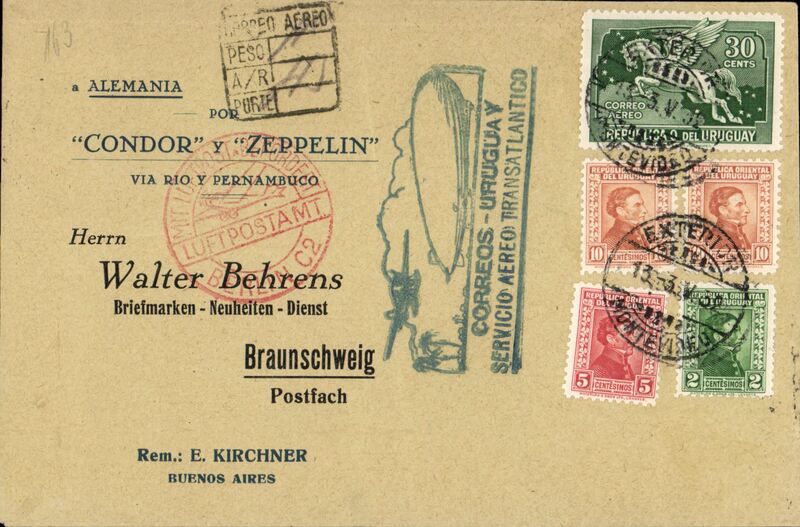 Graf Zeppelin, Bolivia dispatch Recife to Friedrichshafen, bs 27/4, attractive PPC showing statue of Simon Bolivar franked 15c,50c and $1 Bolivia stamps, oval red flight confirmation cachet. 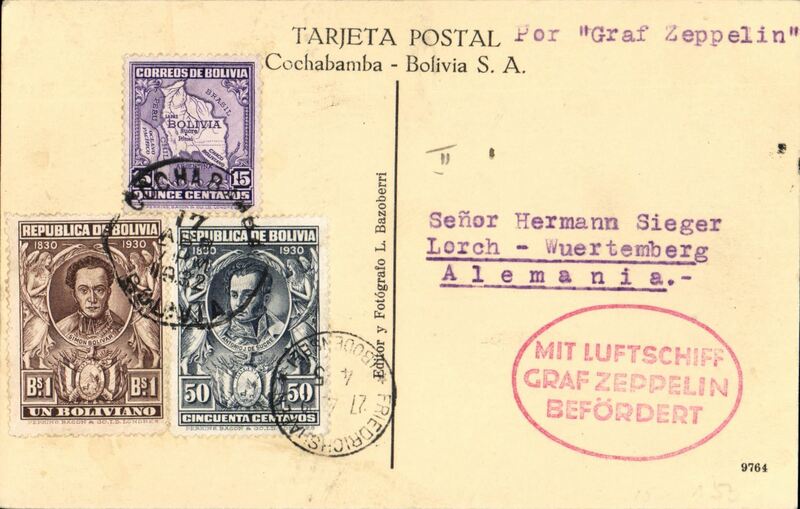 Lloyd Aereo Boliviano/Syndicato Condor/Graf Zeppelin, 4th S. American flight, Cochabamba to Friedrichshafen 10/5, and on to Berlin 10/5, plain cover franked 1.75B, canc Cochabamba cds, blue/white 'Correo Aerea' airmail etiquette, nice strike red circular "Luftpost Befordert/Luftpostampt/Berlin C2" arrival hs. Carried by LAB from Cochabamba to Puerto Suarez, Condor from Corumba -Campo Grande-Tres Lagadas Rio-Bahia-Recife, Graf Zeppelin to Friedrichshafen. 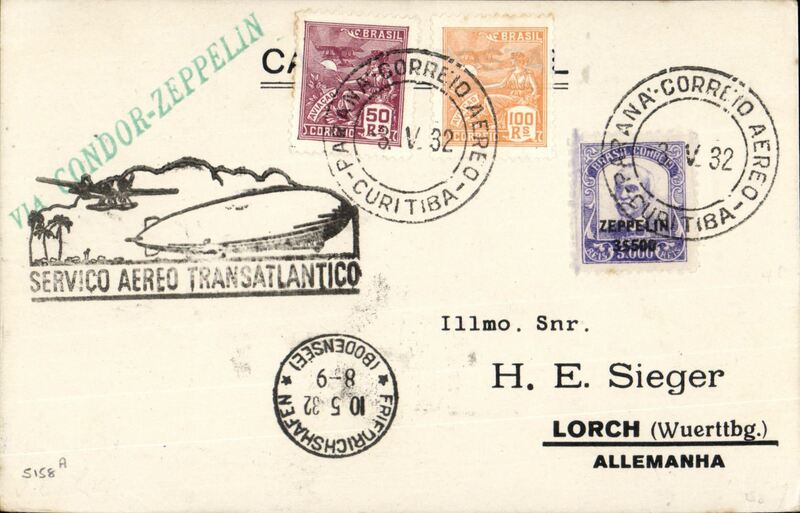 This was the last flight SA zeppelin flight when permission was given for Bolivian material to be carried using Bolivian stamps for postage. 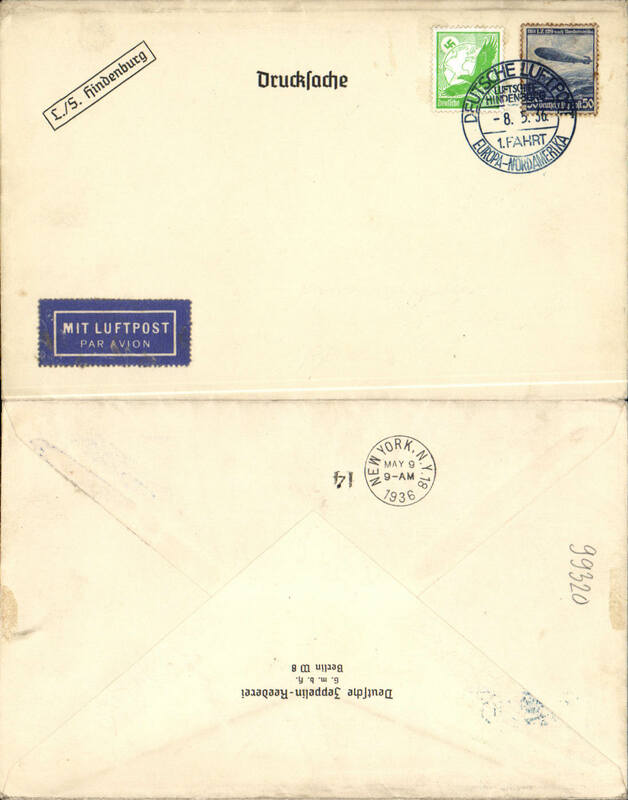 Uruguay dispatch, special printed cover, carried on return 4th SAF, Friedrichshafen 10/5 arrival ds verso, green flight cachet on front. Image. 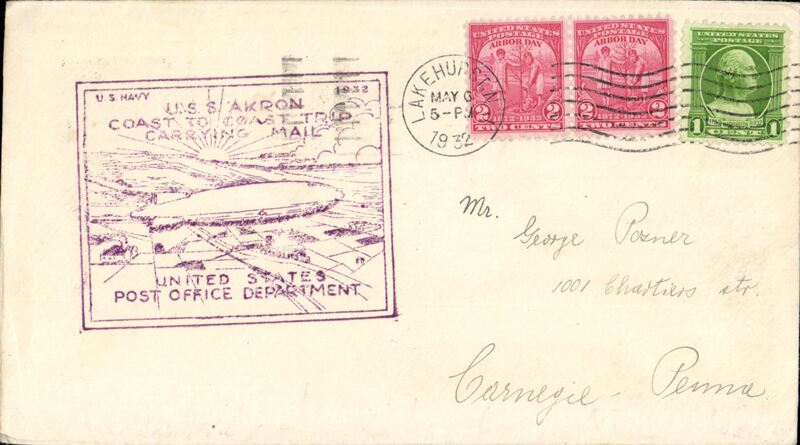 USS Akron (ZR4) Coast to Coast Trip, cancelled Lakehurst NJ, violet boxed United States Post Office Dept cachet on front and oval dr USPOD cachet verso. 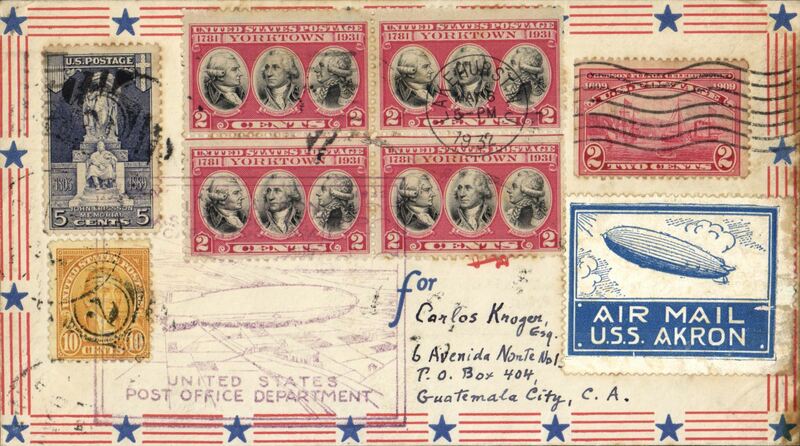 Scarce acceptance of mail for Guatemala for carriage on the USN Airship 'Akron' coast to coast flight from Lakehurst to San Diego, airmail cover franked 25c, canc Lakehurst May 6, 1932, official rectangular flight cachet on front and oval violet flight cachet verso, blue/white airship label (tiny edge scuff), San Diego May 11 cds, and black Guatemala receipt backstamps verso. Slight toning along lh edge, see scan. Great item. 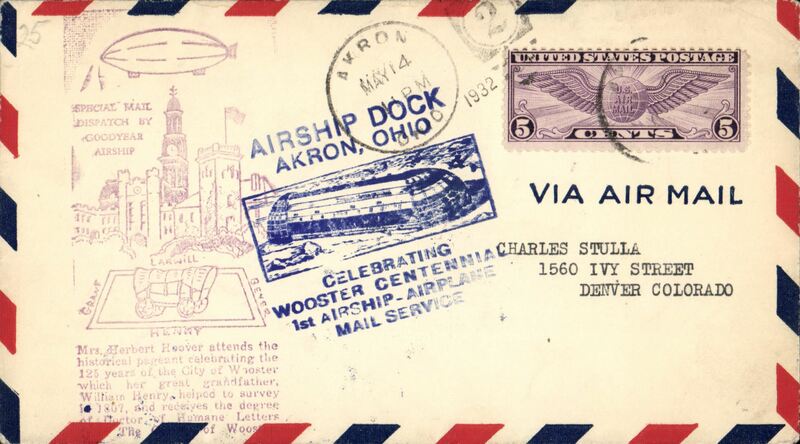 USS Akron (ZR4), blue Wooster Centennial/1st Airship-Airplane Mail Service" cachet, Akron postmark. 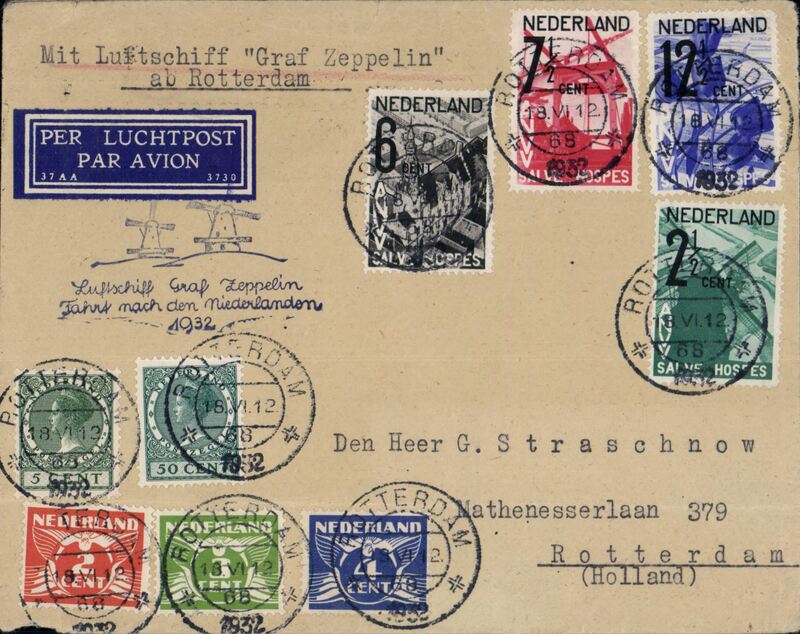 Flown cover Tacoma to Evansville, no b/s, green/white etiquette intended for mail carried by Airship Akron and descibed by Mair ( page 497) as "a great rarity"
Netherlands flight, Rotterdam to Friedrichshafen bs 19/6, official blue flight confirmation cachet, franked 92 1/2c. Closed non invasive tear and corner nibble verso, hardly detracts, see image. 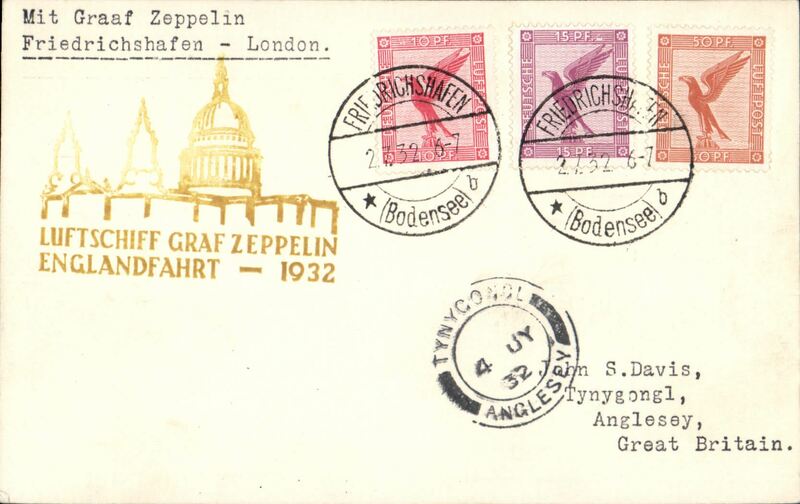 England flight, PC franked 75Pf cancelled Friedrichshafen cds, yellow flight confirmation cachet, typed 'Mit Graf Zeppelin/Friedrichshafen-London'. 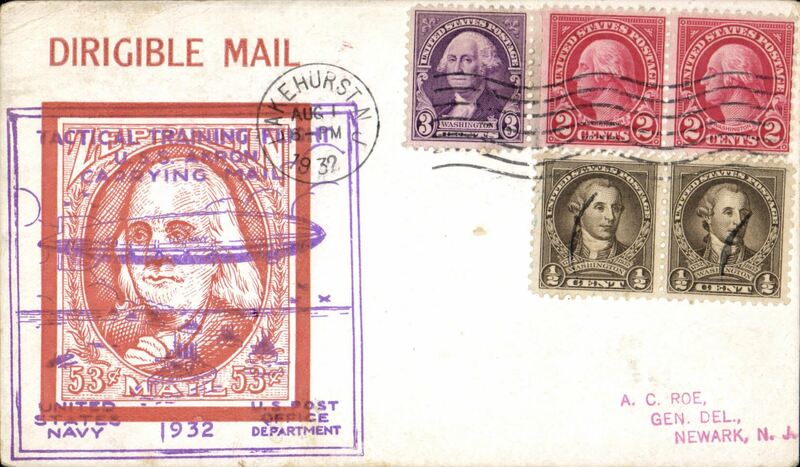 USN Airship 'Akron' Tactical Training Flight from Lakehurst Aug 1, 1932 and return Aug 2, plain cover franked 8c, canc Lakehurst cds, official violet rectangular flight cachet on front , and blue flight cachet verso. 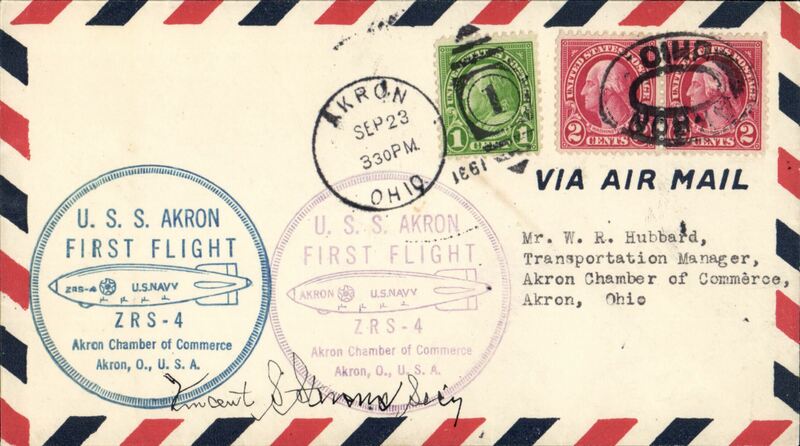 USN Airship 'Akron' Tactical Training Flight from Lakehurst Aug 1, 1932 and return Aug 2, attractive Roessler red 'Dirigable Mail' souvenir card franked 8c, canc Lakehurst cds, official violet rectangular flight cachet on front , and blue flight cachet verso, . 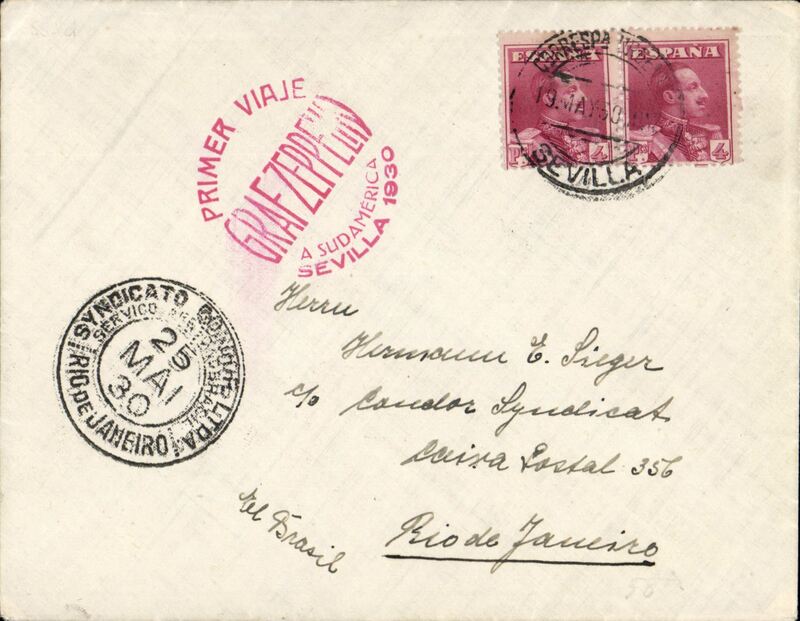 Brazil dispatch, return 8th SAF, cover franked 3700R, Friedrichshafen 19/10 bs, green "Servicio Aereo/Transatalantico/via/Condor Zeppelin" cachet, red 'Mit Luftpost/befordert/Postamt Hannover' arrival hs. 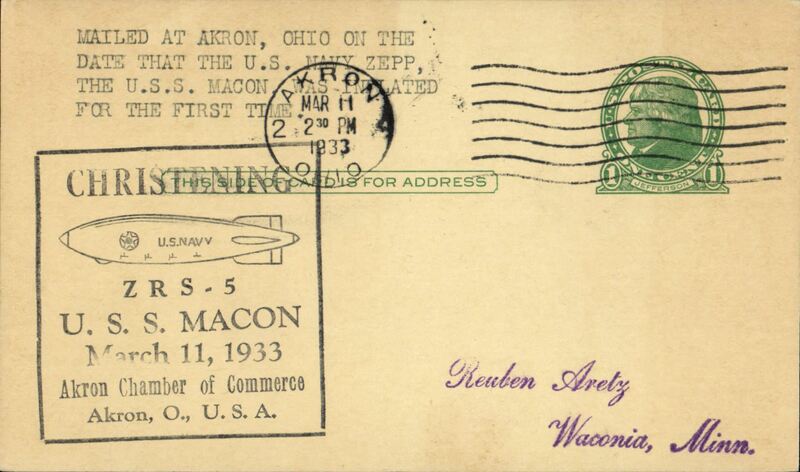 USS Macon (ZR5), first inflation, canc Akron, OH, black framed Akron Chamber of Commerce 'Christening' cachet..
Graf Zeppelin Italian flight, drop at Barcelona, card franked 3l Italian Mail Special Issue, canc Roma/Posta Aerea Zeppelin special hs, also 25c ordinary, dark blue special flight hs, blue/cream Posta Aerea Zeppelin etiquette, verso Roma/Posta Aerea/29.5.33 Crociera Zeppelin 1933-XI machine cancel. 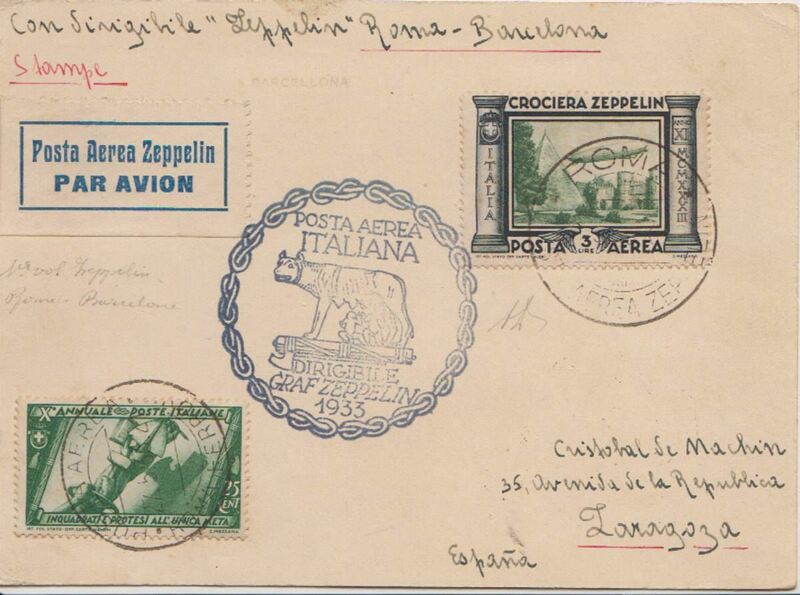 Graf Zeppelin Italy flight, registered (label) 30 PSC canc Roma Ferrovia/29.5.33 with additional Fascist March 5c x3, 15cx2, and 3L Zepellin stamp canc Italy receiving mark. 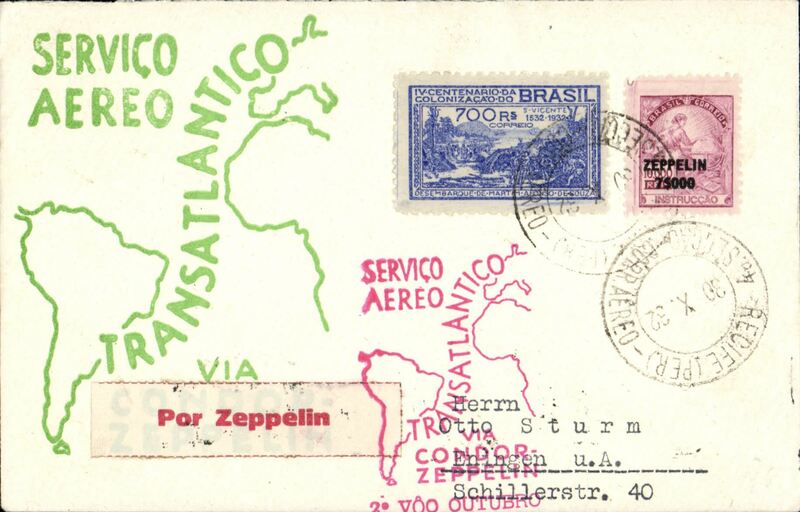 2nd Zeppelin S America Flight to Brazil, bs 6/6, airmail cover franked 1Rm Zeppelin stamp and 50pf canc 'Berlin/2.6.33/L2', green airship confirmation, and red Berlin connecting flight, cachets, verso sealed with German Currency Control tape. 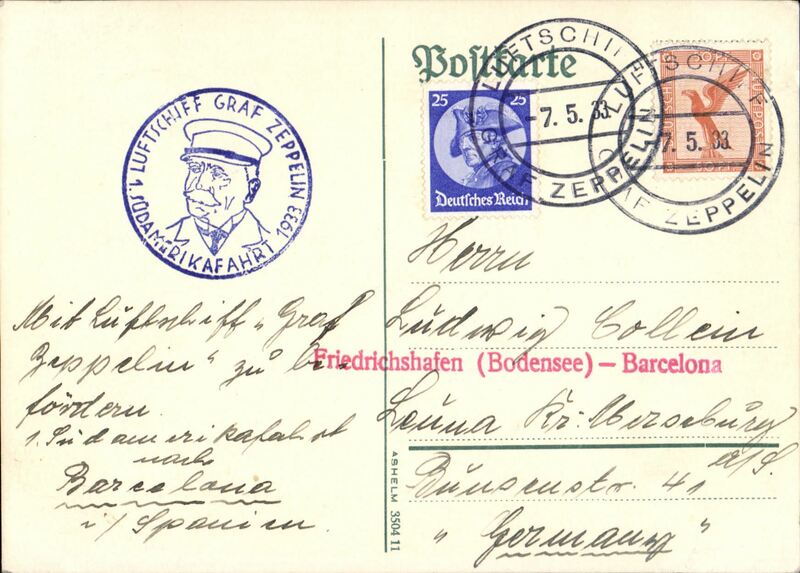 Third South America Flight, mail dropped at Barcelona, bs 3/7, plain cover franked German 1M 50 canc ON BOARD cds, blue framed flight confirmation cachet, red 'Friedrichshafen (Bodense)-Barcelona' hs. 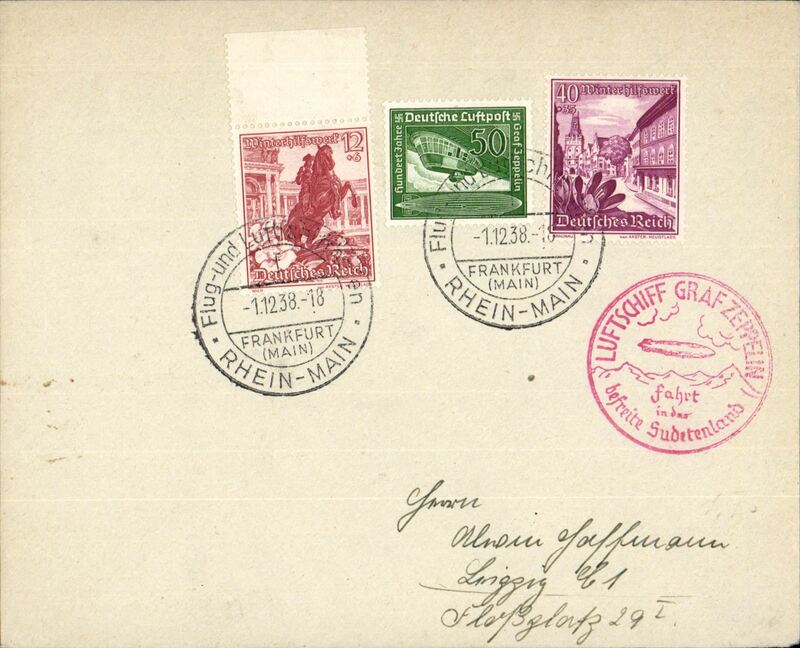 Rio de Janeiro to Friedrichshafen, green 12/9 arrival ds on front, attractive red/white/black registered (label) souvenir card franked 2300R, green triangular Zeppelin flight cachet. 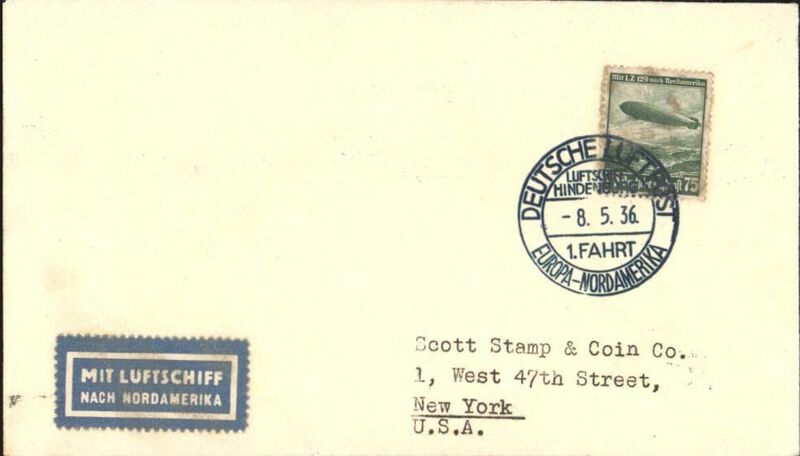 1933 Chicago Flight, an exceptional cover with mixed franking including Germany 1Rm (x2) and 2rm, and US 50c green. 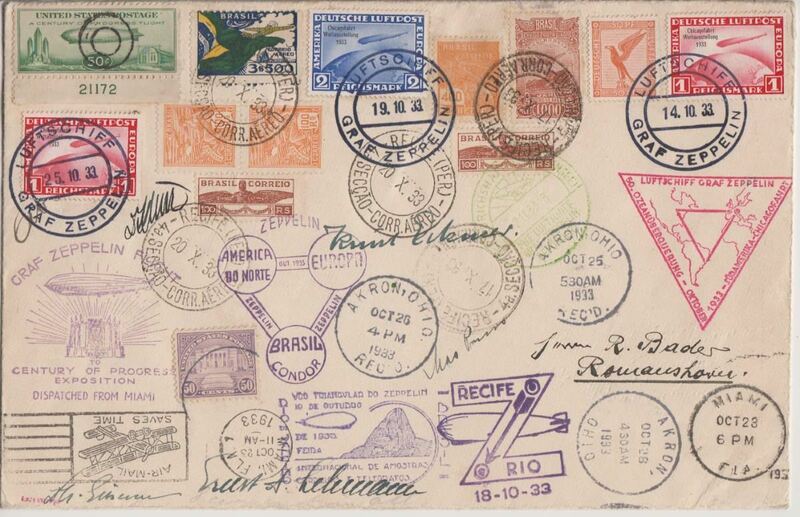 An historic record of the Germany-Brazil-USA-Germany round trip with multiple postmarks including Germany, Brazil (2), Recife-Rio, US Century of Progress Expo (2), and related flight cachets. 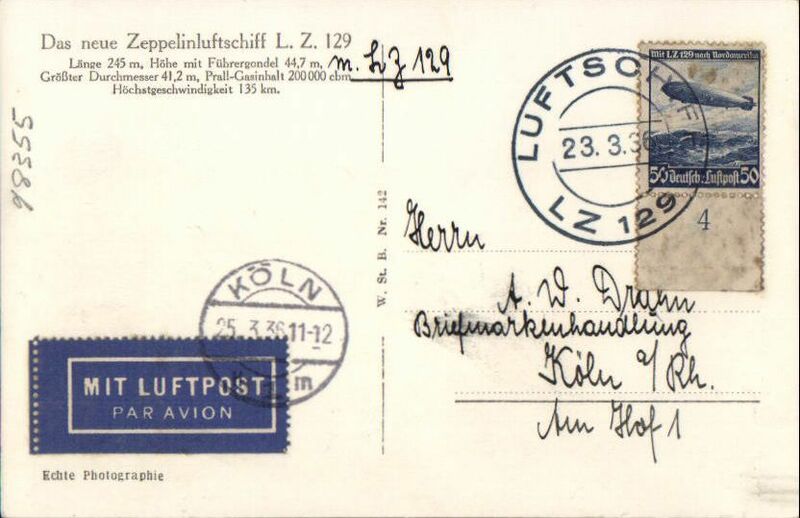 Also bears five signatures of crew members - Hugo Eckener, commander; Ernst Lehmann, captain; Max Pruss, navigation officer; Knut Eckener, helmsman; and Ludwig Durr, chief constructor of the airship. 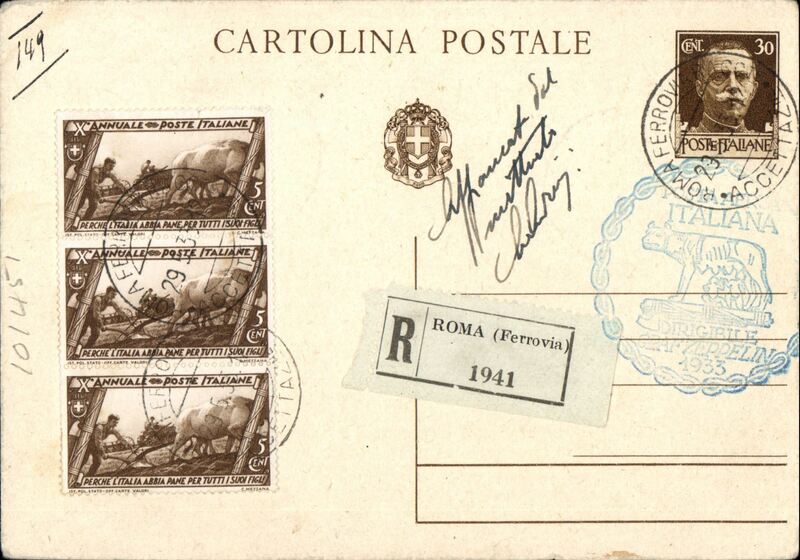 Nine such covers have been recorded, but this is the only one with signatures. 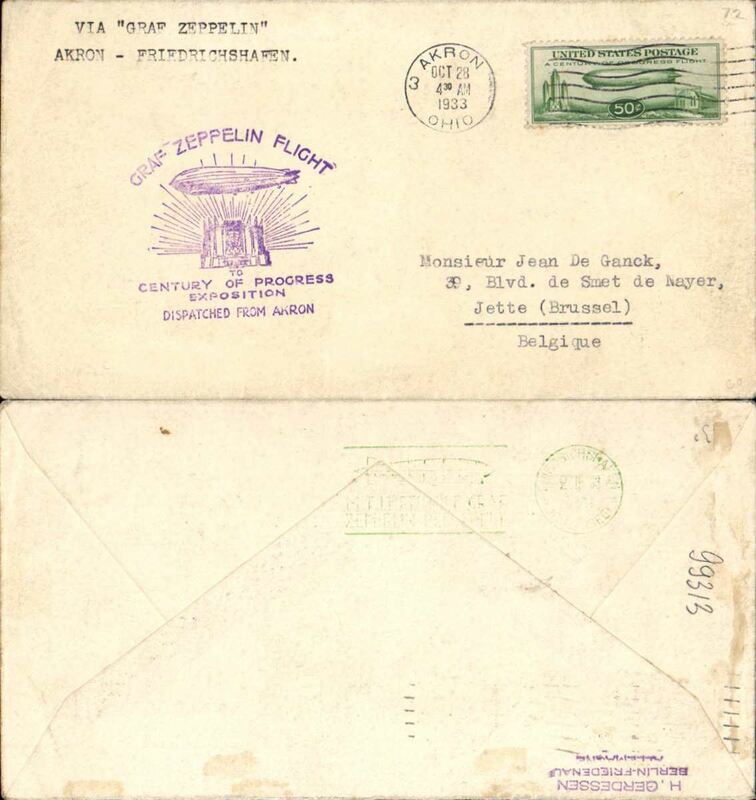 Graf Zeppelin, Chicago flight and 50th Transoceanic flight, Brazil to Europe, plain cover franked 7700R canc Rio de Janero cds, bs Friedrichshafen 2/11. 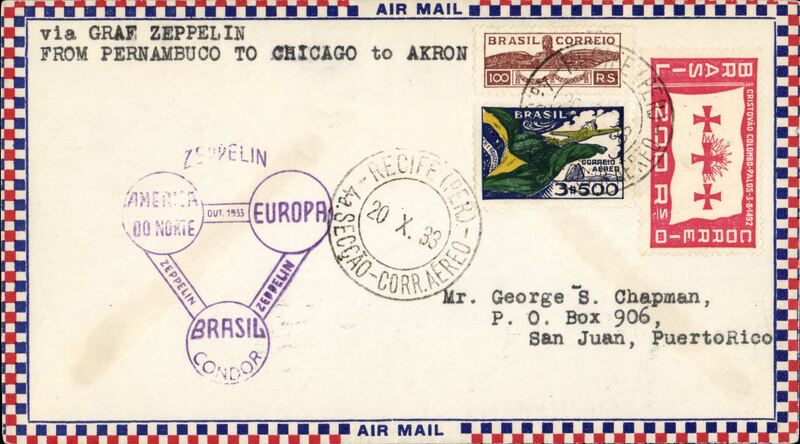 dark blue/white 'Zeppelin' etiquette, Brazil flight cachet, ms 'Via Chicago'. 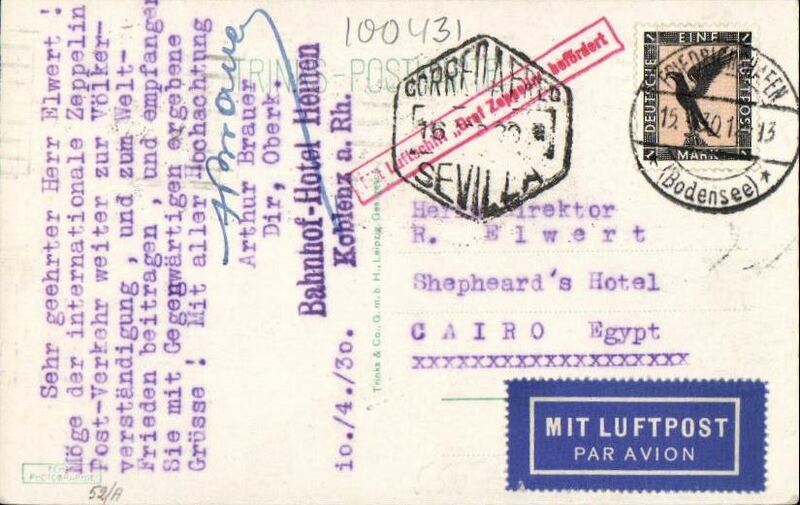 Graf Zeppelin, Recife to Chicago, bs 26/10, plain cover franked 3R800, fine strike purple flight confirmation cachet. 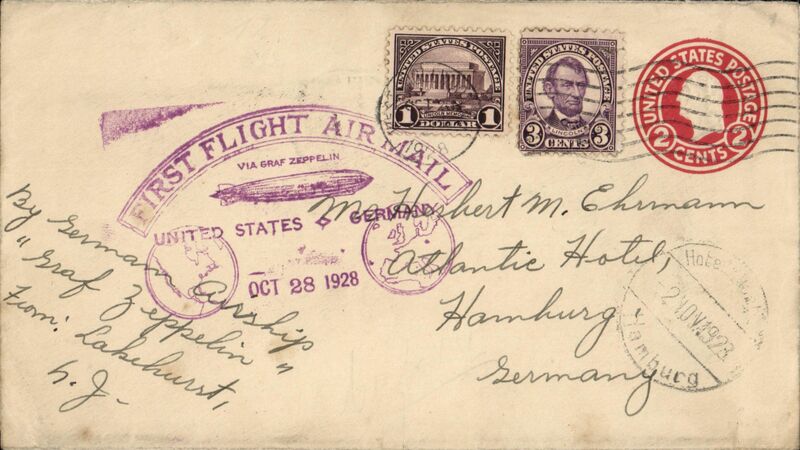 Graf Zeppelin, Recife to Miami, bs 23/10, Roessler attractive small check cover franked 3R800, fine strike purple flight confirmation cachet. 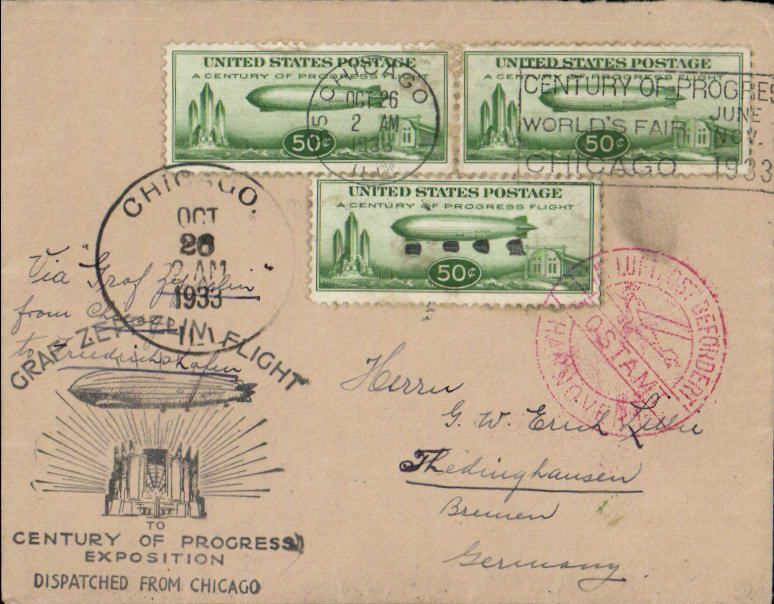 Century of Progress Flight, US Dispatches, Airship "Graf Zeppelin", Chicago to Germany, Friedrichshafen, bs green 2/11machine ds, franked 3x US Zeppelin 50c (C18) canc Chicago cds, black "Graf Zeppelin Flight/Dispatched from Chicago" cachet, red circular 'Mit Luftpost Befordert/Postampt/Hannover arrival ds. 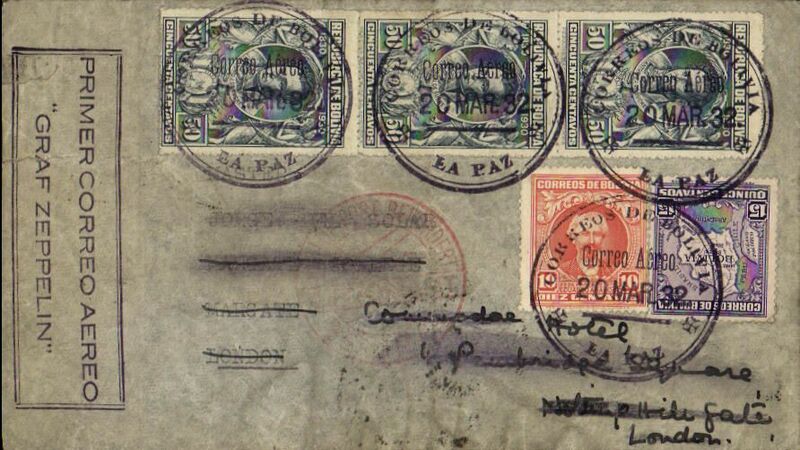 One or two faint tone spots on stamps - see scan. 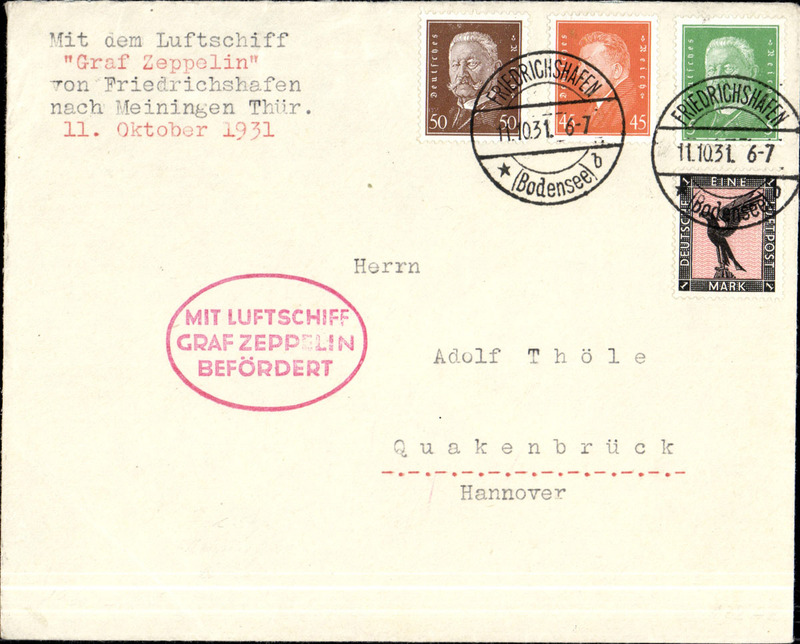 Graf Zeppelin Century of Progress, Akron to Friedrichshafen, bs 2/11, plain cover franked US 50c Zeppelin, canc Akron/Oct 28/1933 cds, purple Zeppelin/Expo flight cachet. 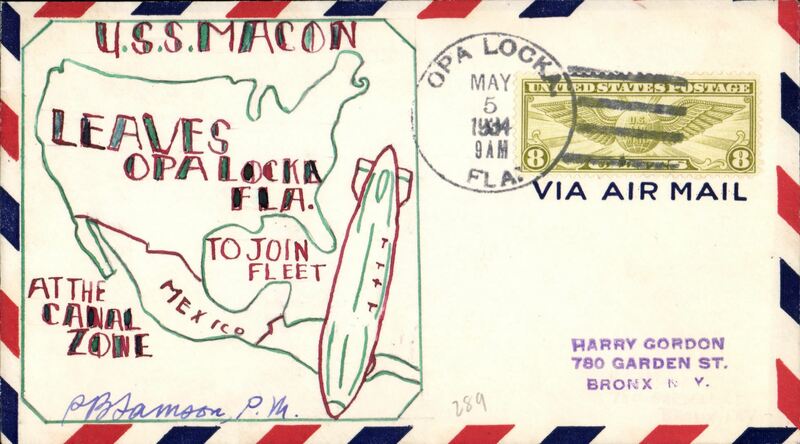 USS Macon (ZR5), green/red "Opa Locka FL", canc Op Locka cds, signed by PM. 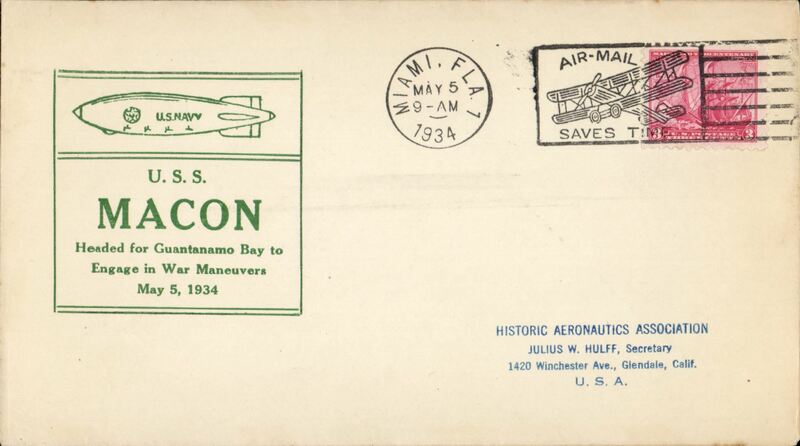 USS Macon (ZR5), green framed "Headed for Guantanamo Bay to Engage in War Manoeuvres" cachet, canc Miami, FL, J Huff Green card, only 8 made. 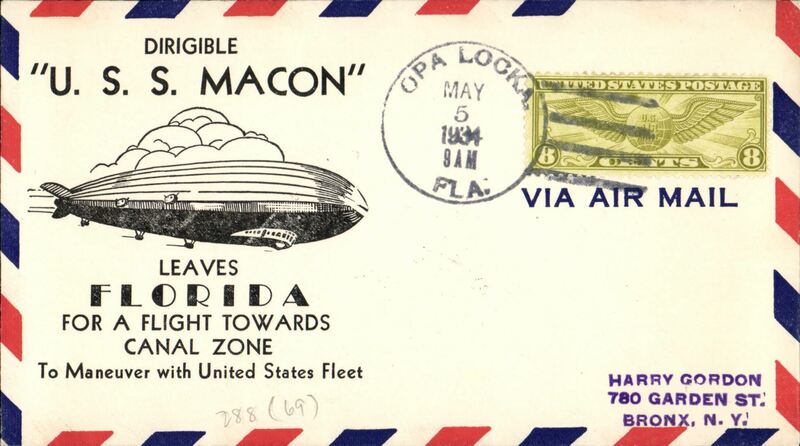 USS Macon (ZR5), green/brown "Passes Over Coconut Grove,Fla", canc Miami, FL, Ed Hacker card, 81 made. 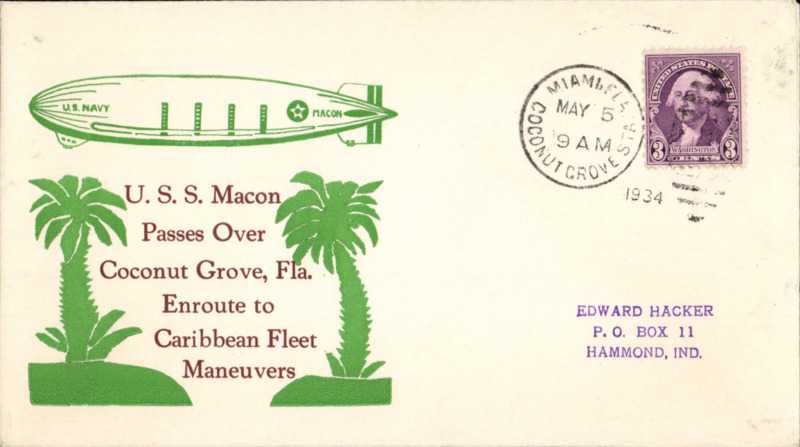 USS Macon (ZR5), green/red framed "Leaves Miami for Fleet Manoeuvrers in Caribbean Sea" cachet, canc Miami, FL, L Gilman card, only 20 made. 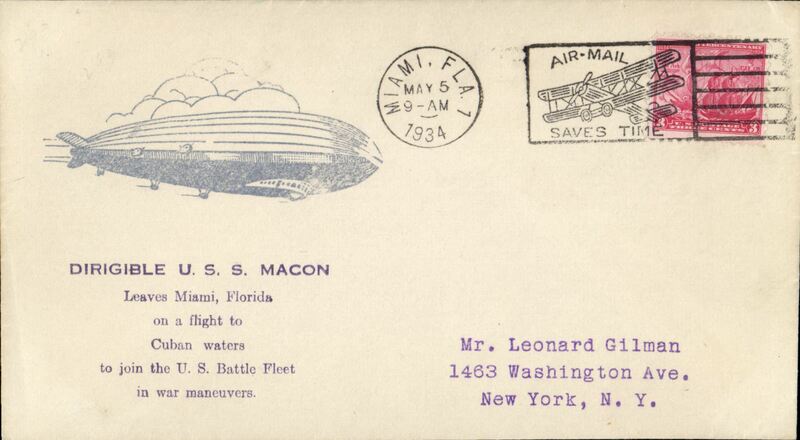 USS Macon (ZR5), silver "Leaves Miami, Florida on a Flight to Cuban Waters .........." cachet, canc Miami, FL. 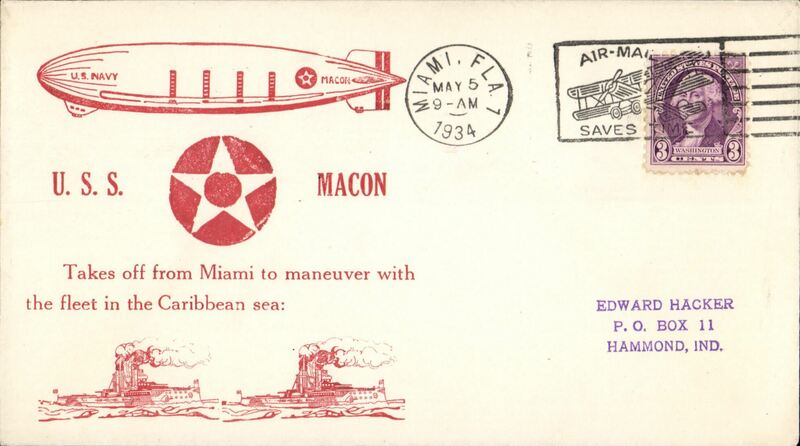 USS Macon (ZR5), red "Takes Off From Miami to Manoeuvre with the Fleet in the Caribbean Sea" cachet, canc Miami, FL, E Hacker card, 60 made. 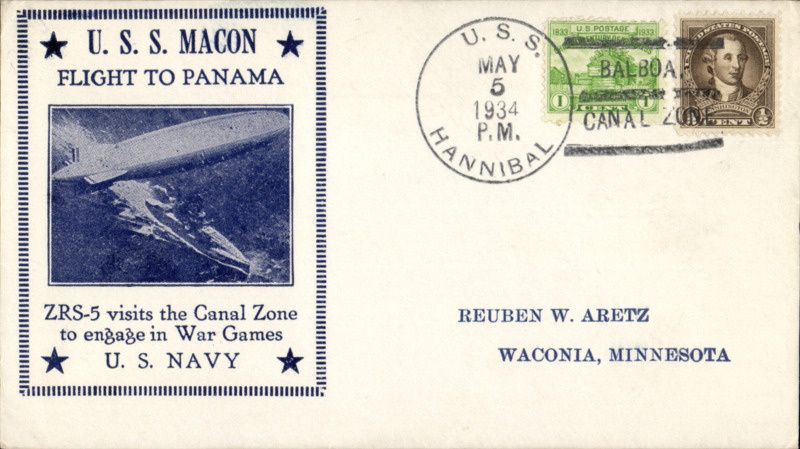 USS Macon (ZR5), blue framed "Flight to Panama" cachet, canc USS Hannibal, R. Aretz card. 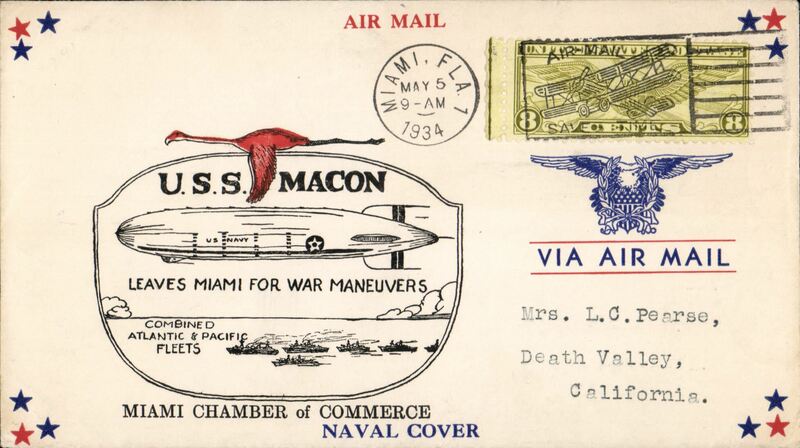 USS Macon (ZR5), red/black "Leaves Miami for War Manoeuvres" C of C cachet, canc Miami. 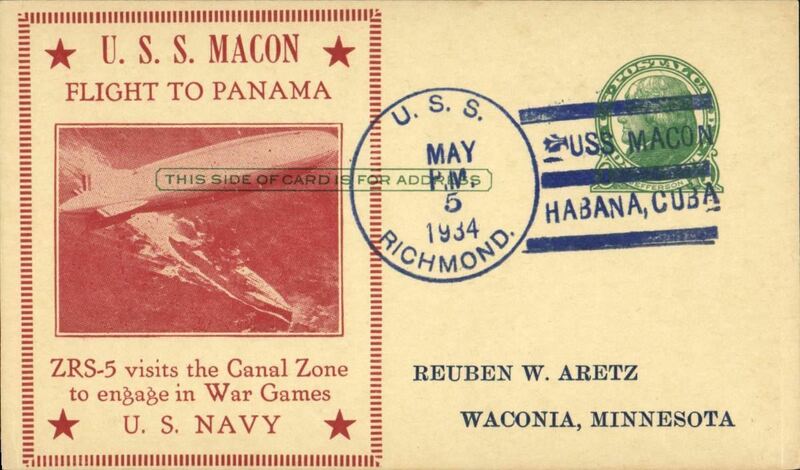 USS Macon (ZR5), red framed "Flight to Panama/Visits the Canal Zone to engage in War Games" cachet, USS Richmond machine cancel,R Aretz card, Opa Locka cds, M Sussman card, 69 made. 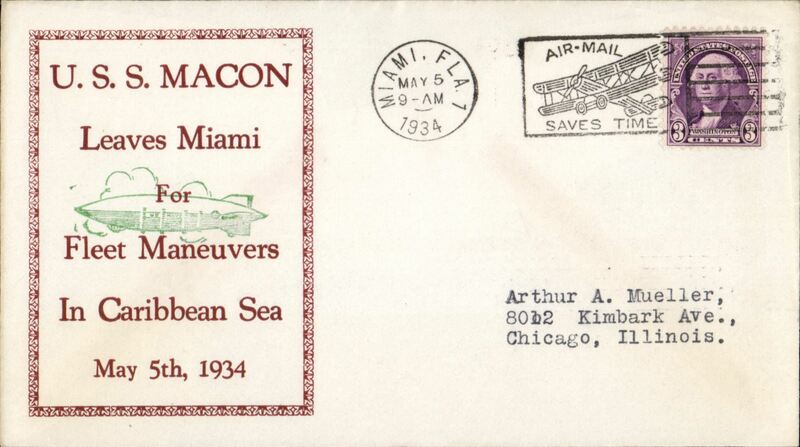 USS Macon, "Leaves Miami for War Manoeuvres" Miami C of C cachet, Miami, FL canc. 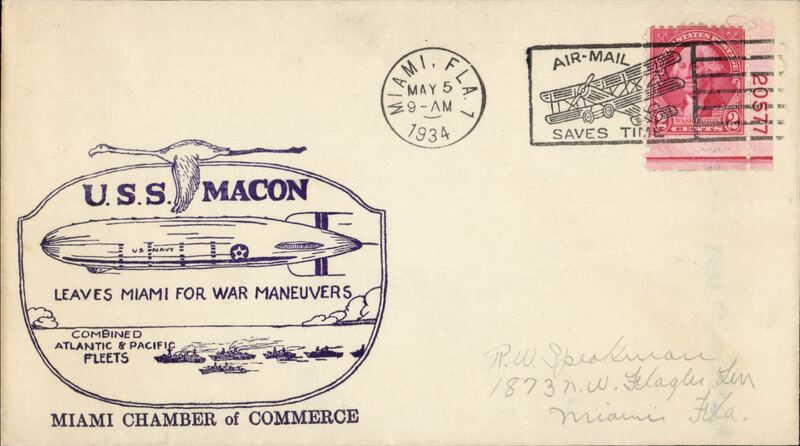 US Macon (ZR5), " Leaves Florida for a Flight towards the Canal Zone" cachet, Oa Locka machine cancel, M Sussman card, 69 made. 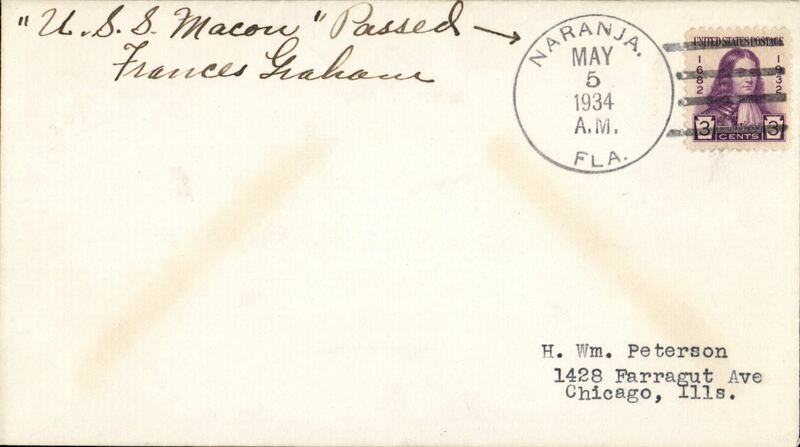 USS Macon (ZR5), ms 'USS Macon "Passed", canc Naranja, FL, signed by PM. 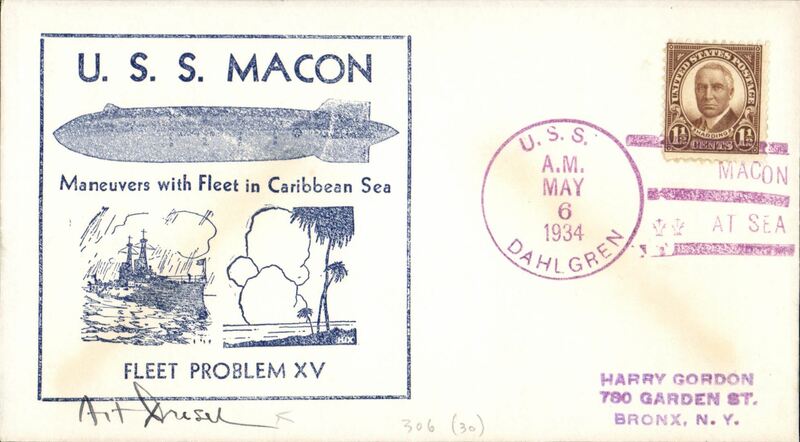 USS Macon (ZR5), blue frame "US Macon/Manoeuvres in Caribbean Sea/Fleet Problem XV" cachet, magenta USSS Dahlgreen canc, M Sussman with Hax Cuts, 30 made. 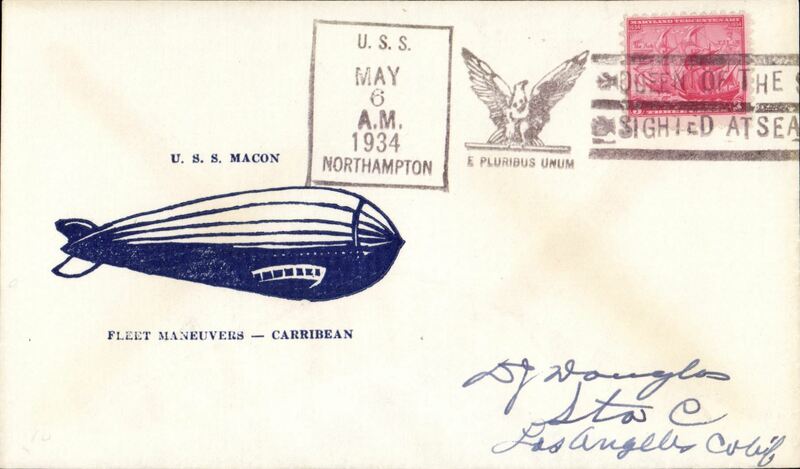 USS Macon (ZR5), dark blue "Fleet Manoeuvres - Caribbean" cachet, canc USS Northampton. 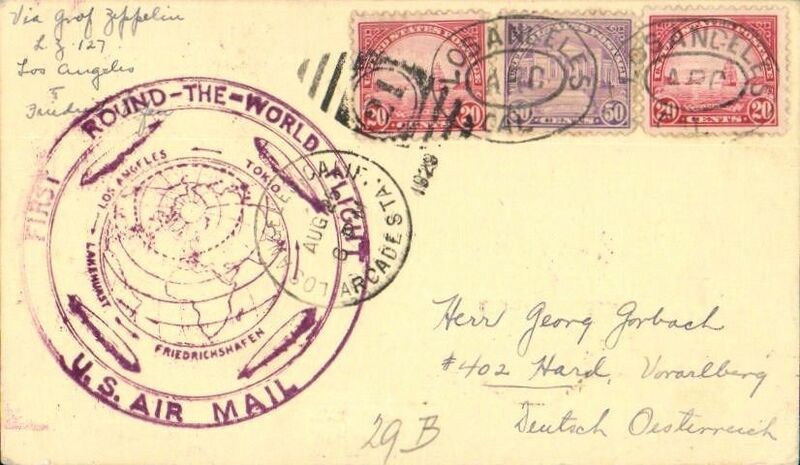 Third South America Flight, Argentina mail dropped at Barcelona, bs 5/7,'An Bord Graf Zeppelin' corner cover franked German 1M 50 canc ON BOARD cds, violet flight confirmation cachet, violet 'Abwurf Barcelona' hs. 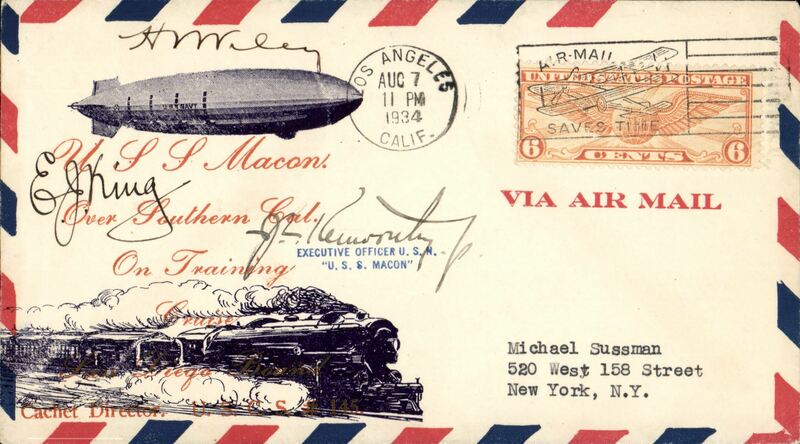 USS Macon (ZR5), 'Over Southern California/On Training', cancelled Los Angeles, Calif, black printed cachet, R Dumonte orange/black cover, signed by the crew including the Executive Officer. 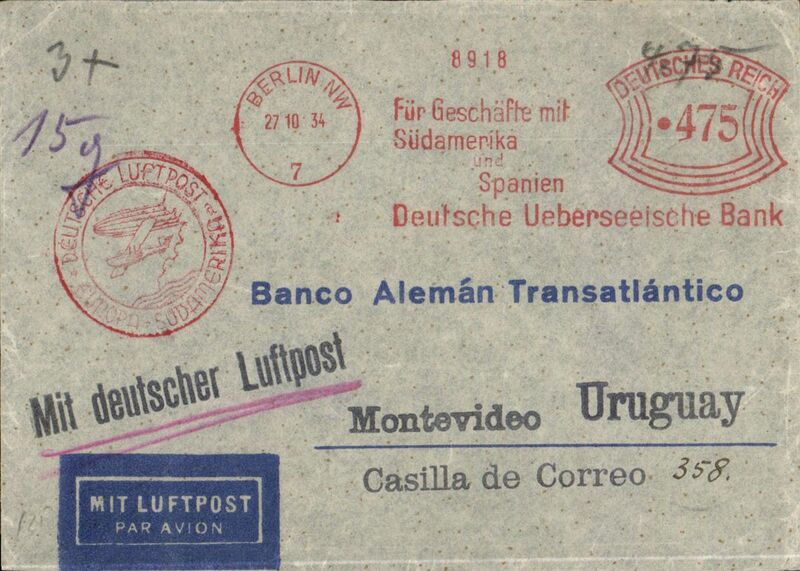 Eleventh South America Flight, Berlin to Montevideo, bs 2/11, Banco Aleman Transatlantico imprint airmail cover, uncommon red Berlin NW 475 pf meter frank, fine strike red circular "Deutsche Luftpost/Europa-Sud Amerika" flight cachet, fair strike purple 'Condor Zeppelin' hs verso. 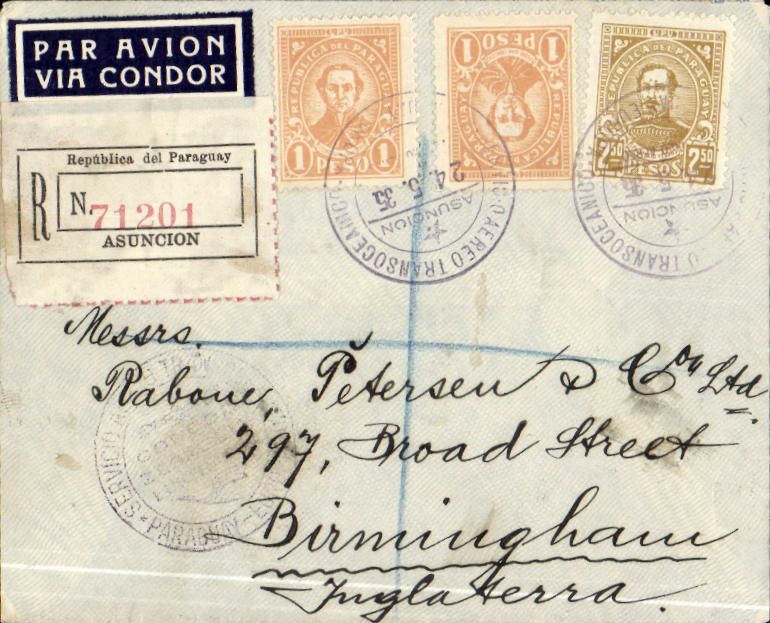 Paraguay to England, Asuncion to Birmingham, no arrival ds, carried on the Graf Zeppelin 4th South America Flight, registered (label) cover franked 27P, canc 'Servicio Aereo Transocianica/Asuncio/24.5.35/Paraguay' cds, black circular South America Zeppelin airpost confirmation mark, dark blue/white "Par Avion/Via Condor" airmail etiquette..
Hindenburg First Mail Flight, Friedrishchafen to Friedrishchafen, Attractive B&W photocard franked 50pf, canc black 'Luftschiff/23.3.36/LZ 29' on board postmark, Koln 25/3 arrival ds on front. Picture shows LZ 29 'rising for the first time'. 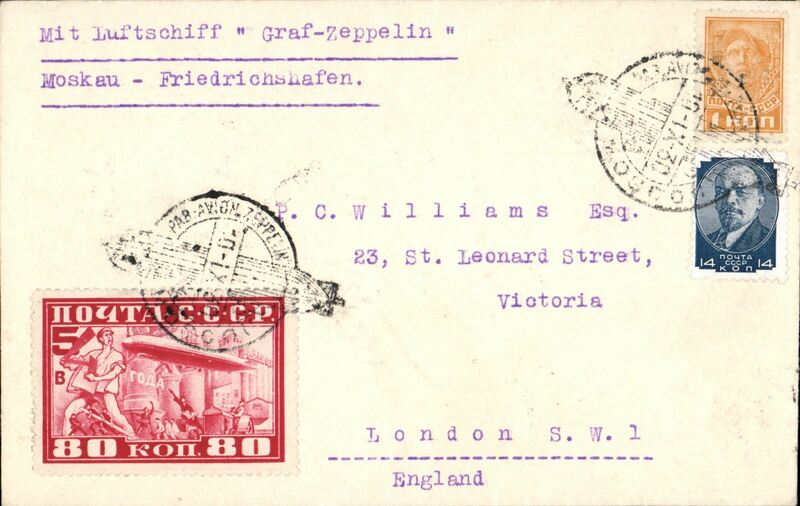 Some toning on 50pf Zeppelin stamp. 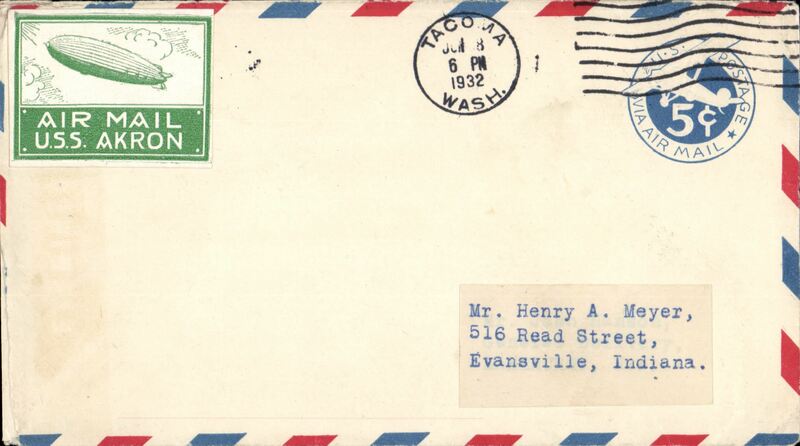 Hindenburg First North America Flight, Germany to New York, bs 9/5, plain cover franked 65pf, canc green 'Deutsche Luftpost/8.5.36/ Europa-Nordamerika' on board postmark. Some perf toning on 50pf Zeppelin stamp. 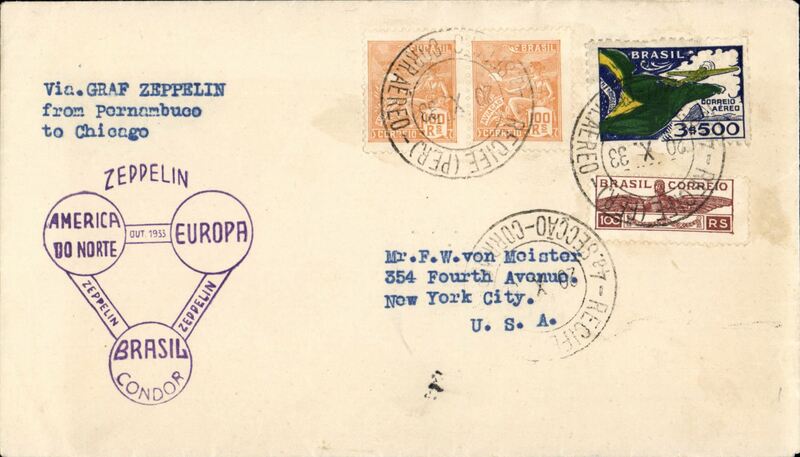 Hindenburg First N America Flight, Germany to New York, bs 9/5, plain cover franked 75pf, canc green 'Deutsche Luftpost/8.5.36/Europa-Nordamerika' on board postmark. Some toning on 75pf Zeppelin stamp. 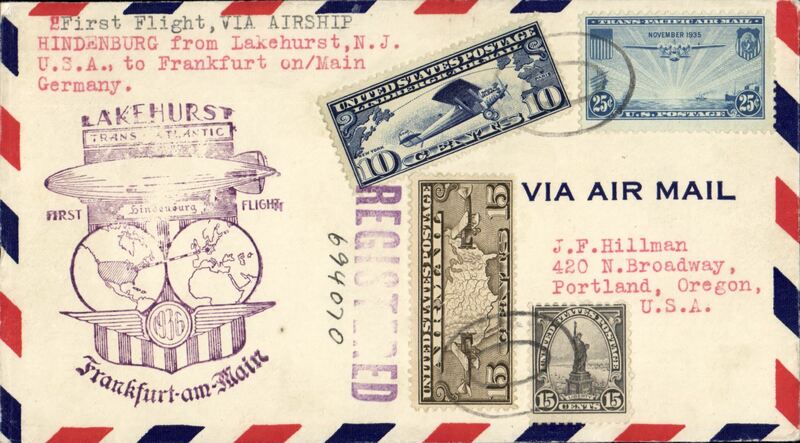 Hindenburg flight, Lakehurst to Frankfurt, bs 14/5, US mail, airmail cover franked 65c US stamps, New York 11/5 ovl ds verso. 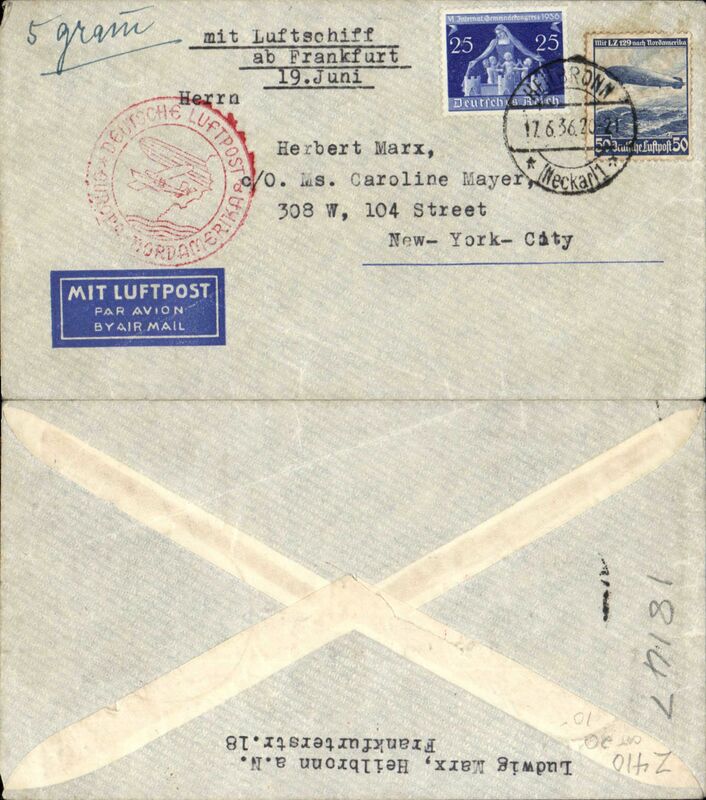 Costa Rica acceptance for return of LZ129 Hindenburg, 1st North America flight, Lakehurst to Germany, b/s Frankfurt (Main) 14/5, via Brownsville 3/3 transit cds, registered (label) cover, dual franked franked 2Col and 48c US stamps all cancelled 'Correo Aereo/May 1 1936/Costa Rica' cds, violet US Lakehurst-Frankfurt flight confirmation mark, black framed endorsement "By First Flight Hindenburg', attractive red/white/blue airmail etiquette. Catalogued 1250 Euros Sieger (2001). 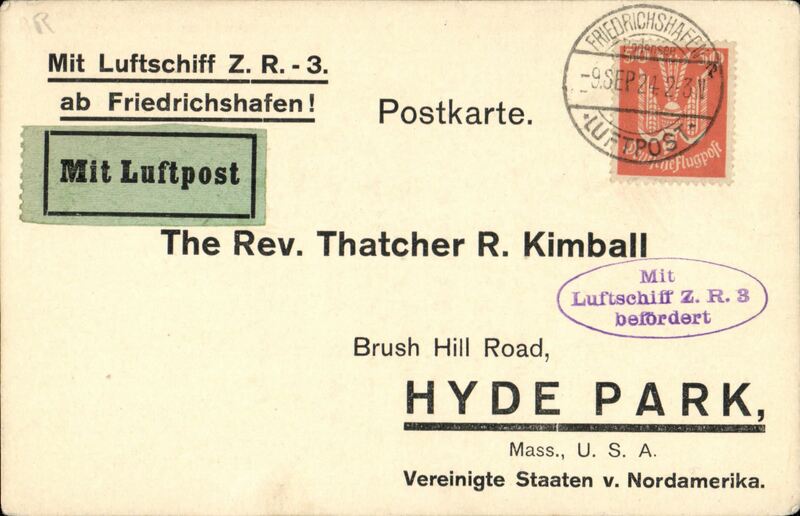 Hindenburg, return of the first North America flight, Lakehurst to Frankfurt, attractive PPC franked 57pf canc 'Deutsche Luftpost/12.5.36/1,Fart/Europa-Nordamerika' on board postmark, Frankfurt type 1 ' arrical ds on front. 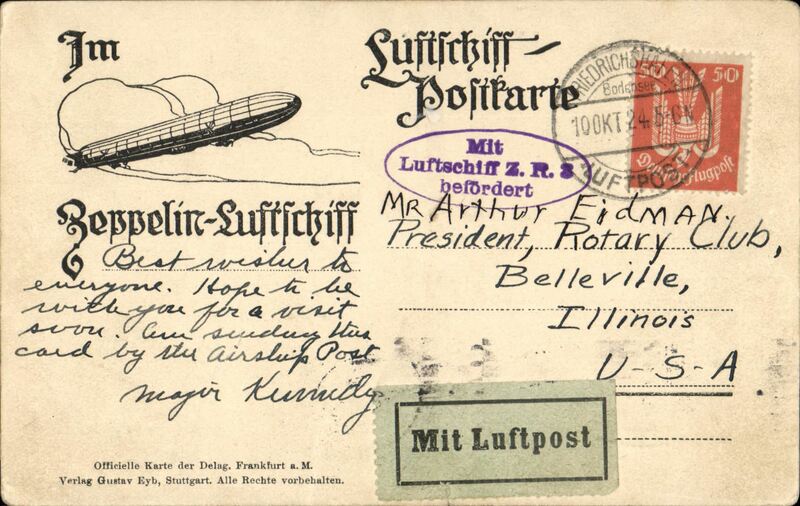 Picture verso shows picture of airship and "Erster Aufstieg des Luftschiffes Graf Zeppelin /am 2 Jul 1900 (Momentaufnahme)". 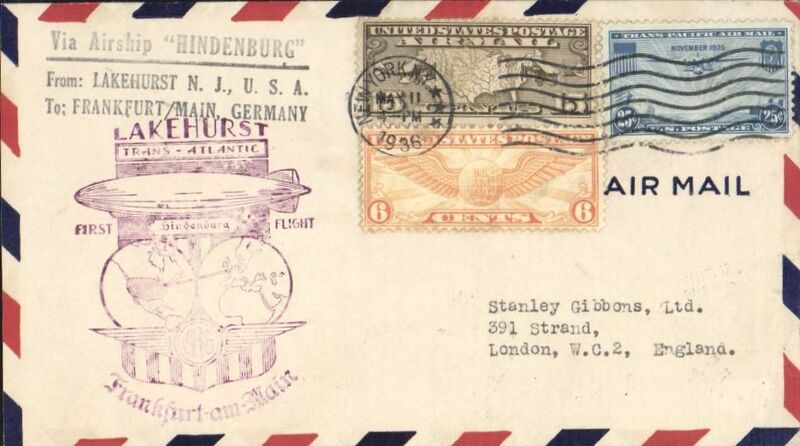 "Hindenburg” return flight from Lakehurst to Frankfurt, black Frankfurt 14/5 arrival ds, violet US flight cachet, black three line "Via Airship Hindenburg ..................." hs, franked 46c canc New York 11/5 cds. 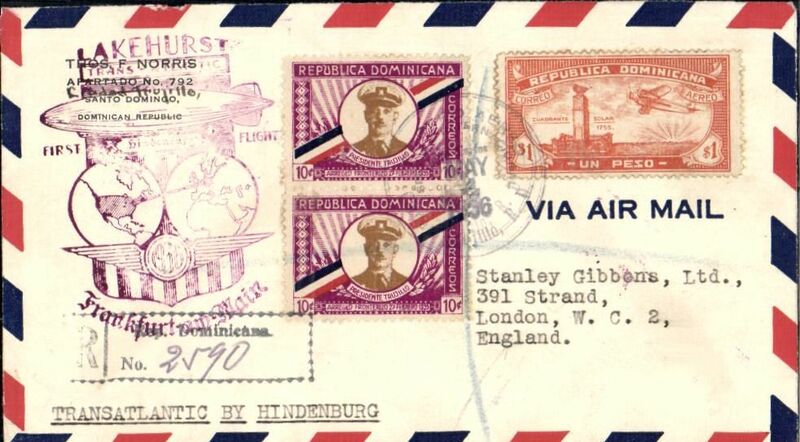 Dominican Republic acceptance for return of LZ129 Hindenburg, 1st North America flight, Lakehurst to Germany, b/s Frankfurt (Main) 14/5, franked $1.20 canc Trujillo cds, violet US Lakehurst-Frankfurt flight confirmation mark, typed endorsement "Transatlantic by Hindenburg". Uncommon acceptance, only 10 flown. Catalogued 1250 Euros Sieger (2001). 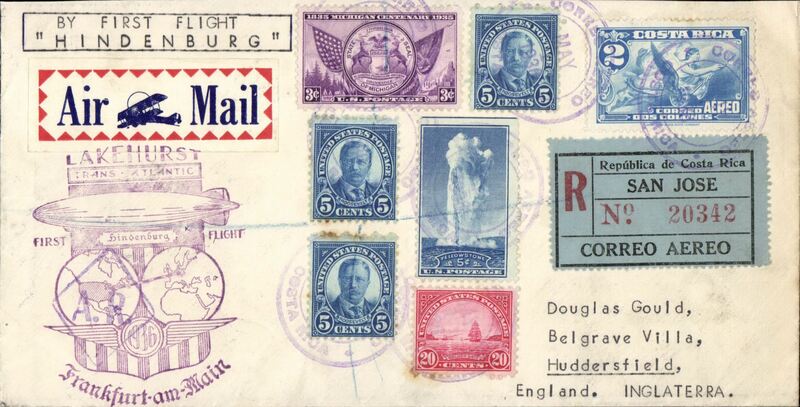 "Hindenburg” return flight from Lakehurst to Frankfurt 14/5, black Frankfurt arrival ds, violet US flight cachet, black three line "Via Airship Hindenburg ..................." hs, franked 45c canc New York 11/5 cds. 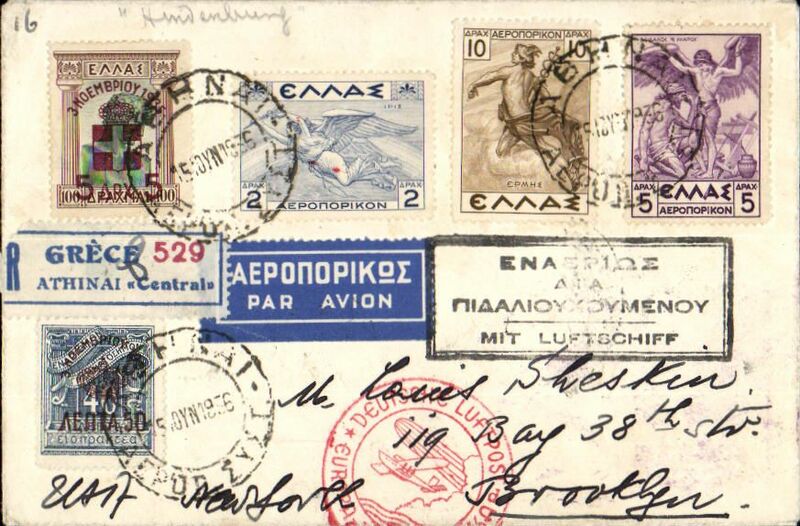 Greece acceptance for the HIndenburg 3rd North America flight, Athens to Brooklyn, bs Jun 22 1936 cds, registered (label) cover franked 23d 64l, canc Athens 15 Jun 36 cds, bilingual airmail etiquette fied by Greek black framed "Mit Luftschiff" flight cachet, red 'Deutsche Luftpost/Europa-Amerika' receiver on front. 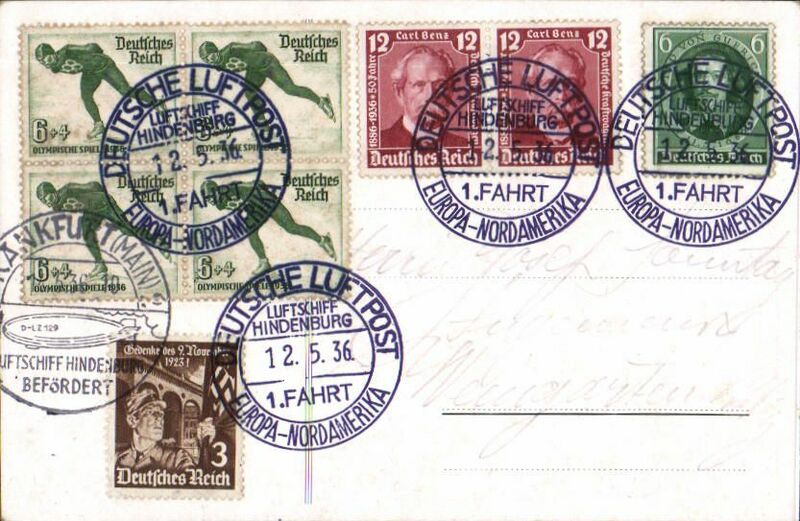 Third North America Flight, Frankfurt to New York, no arrival ds, imprint airmail etiquette cover franked 75pf, ms '5 gm', canc Heilbronn/17.6.36 cds, red double ring 'Europa-NordAmerika cachet, typed "mit Luftschiff/ab Frankfurt/19.Juni". 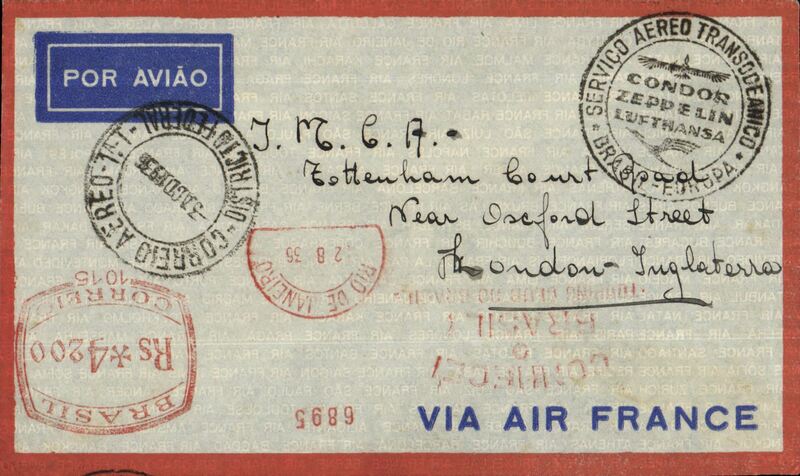 Rio de Janeiro to Friedrichshafen, Air France orange border envelope franked Rs 4200 metre mark, black Correo Aereo/ 3 Ago 1936/Districto Federal cds. 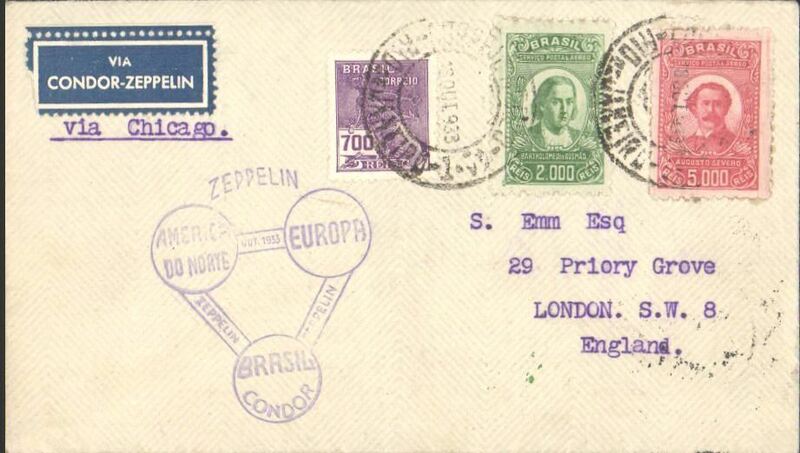 also red semicircle Rio de Janeiro 2.8.36 and black circular 'Servicio Aereo Transoceanico/Brasil-Europa' confirmation cachet. Image. 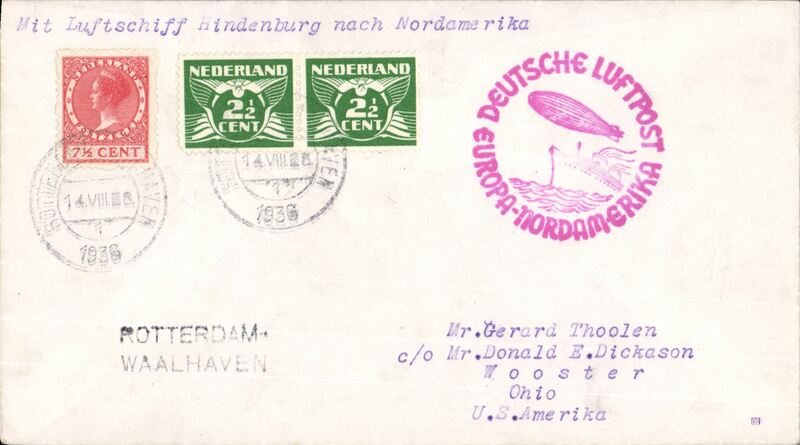 Netherlands acceptance for the Seventh “Hindenburg” Flight to New York, posted in Netherlands with 12 1/2c stampsl, red double ring cachet depicting flying boat and Zeppelin, plain cover, black 'Rotterdam/Waalhaven' hs..
Hindenburgh, 8th North America Flight, souvenir B&W PPC showing airship in flight, franked 75pf, canc 'On Board' Deutche Luftpost/19.9.36/Europa-Nord Amerika cds , magenta double ring 'Europa-Nord Amerika' cachet. 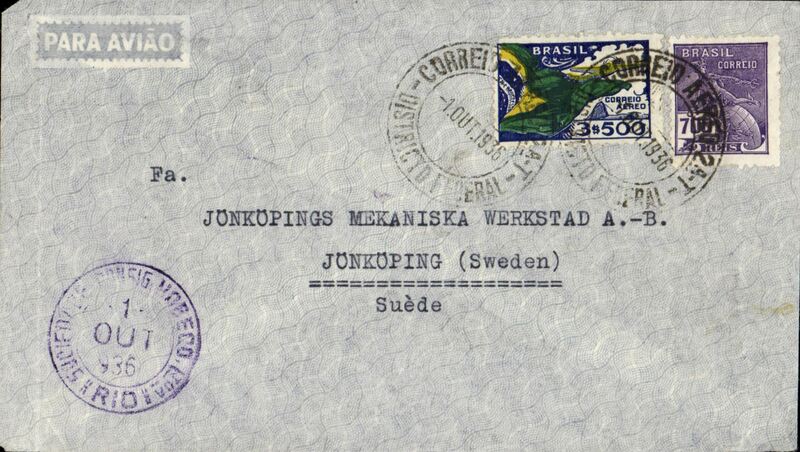 South Atlantic Airmail Service, Brazil to Sweden, bs Malmo 5/10, pale grey airmail cover franked 4200R, canc Rio de Janeiro cds, carried by DLH Graf Zeppelin, flight G562, which dropped mail for Frankfurt at Las Palmas on 4/10. See Graue and Duggan p 202. 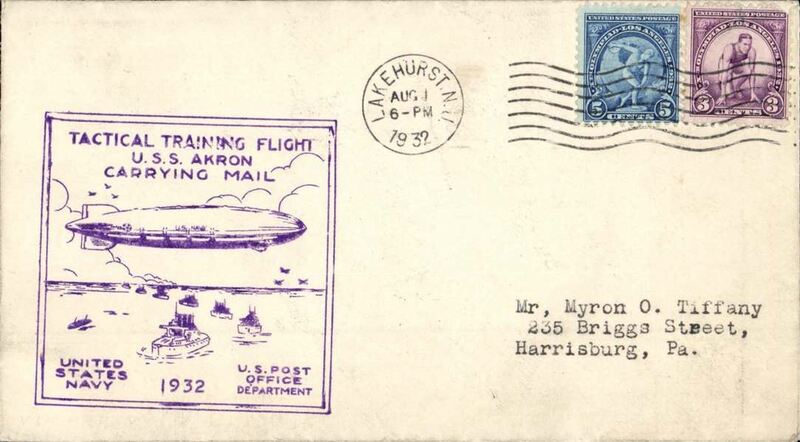 Airship, Eighth North America flight of the Hindenburg, Frankfurt-Lakehurst, no arrival ds, On Board postmark, red flight confirmation cachet, attractive B&W PPC, franked 65pf showing L129 Hindenburg leaving hangar in Rhein-Main near Frankfurt. 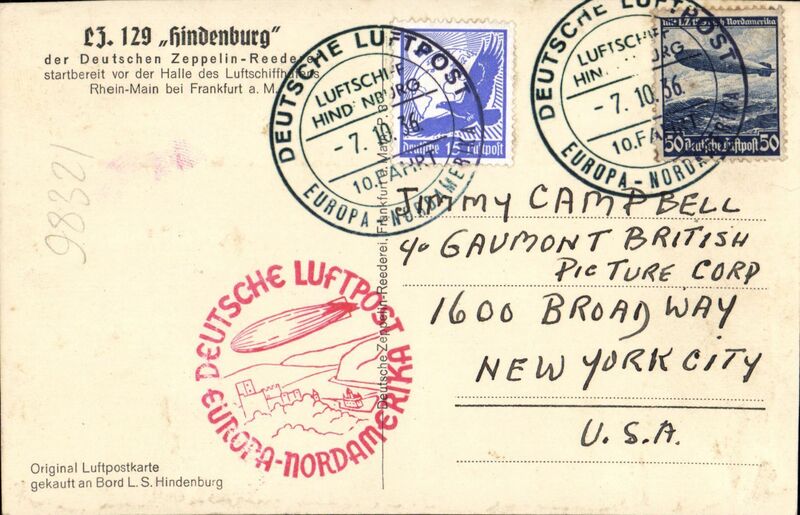 Airship, Tenth North America flight of the Hindenburg, Frankfurt-Lakehurst, no arrival ds, on Board postmark, red flight confirmation cachet, Hindenburg souvenir cover addressed to the Gaumont British Picture Group, Broadway, franked 700pf, some toning. 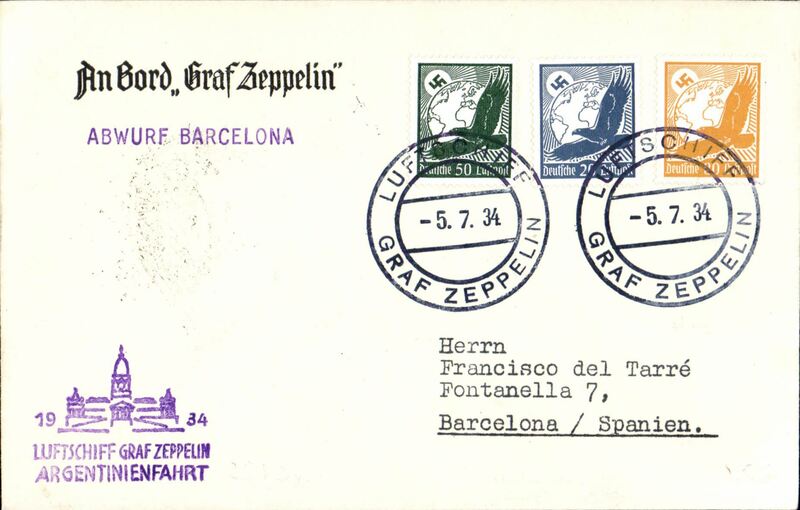 on Zep stamps. 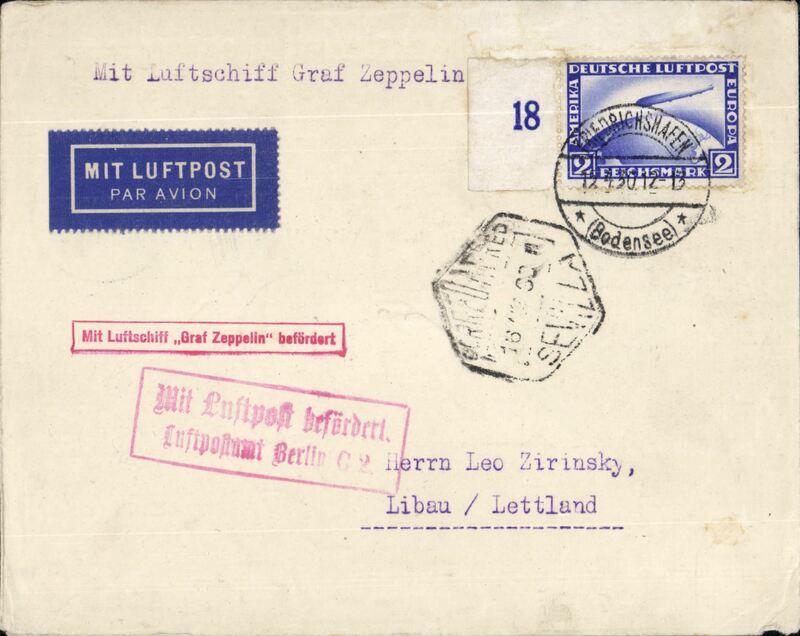 First mail carrying flight of the new LZ 130 'Graf Zepelin' to the Sudetenland, plain cover franked102pf, red circular flight conirmation cachet. 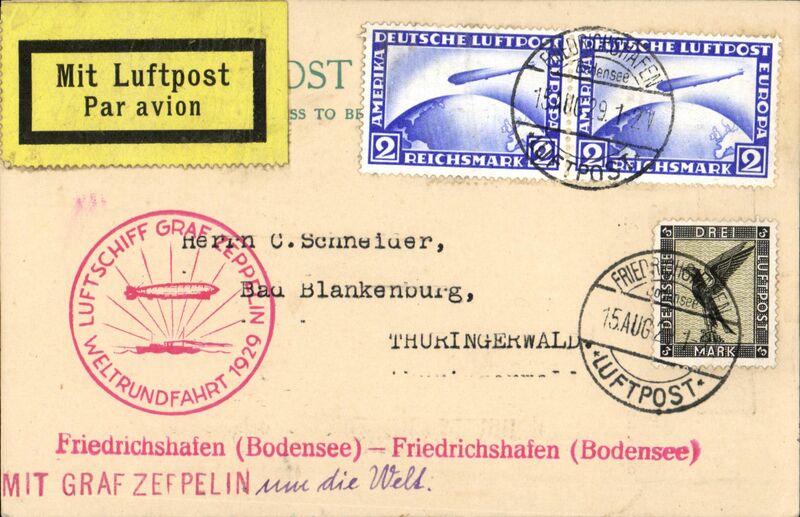 First mail carrying flight of the new LZ 130 'Graf Zepelin' to the Sudetenland, plain cover, 19x12cm, franked100pf, red circular flight conirmation cachet.